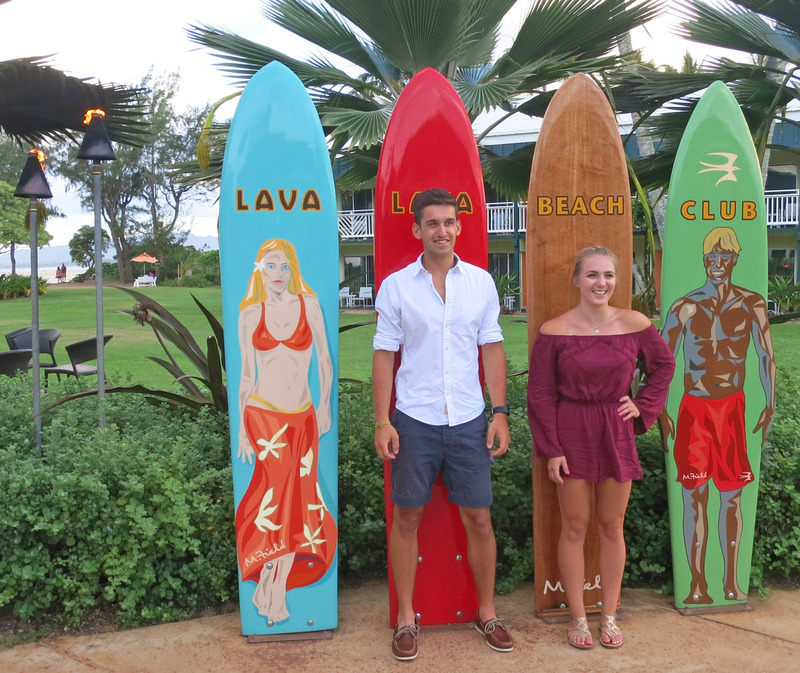 On 7/14/2017 Katherine and me (Brian) travelled to Hawaii for two nights. We met up with Will and Lia but this time we did NOT stay in their very nice VRBO near Princeville, Kauai, Hawaii, instead we stayed at the St Regis Hotel Kauai. Here are some pictures, click on any of them to get a HUGE highest quality original. 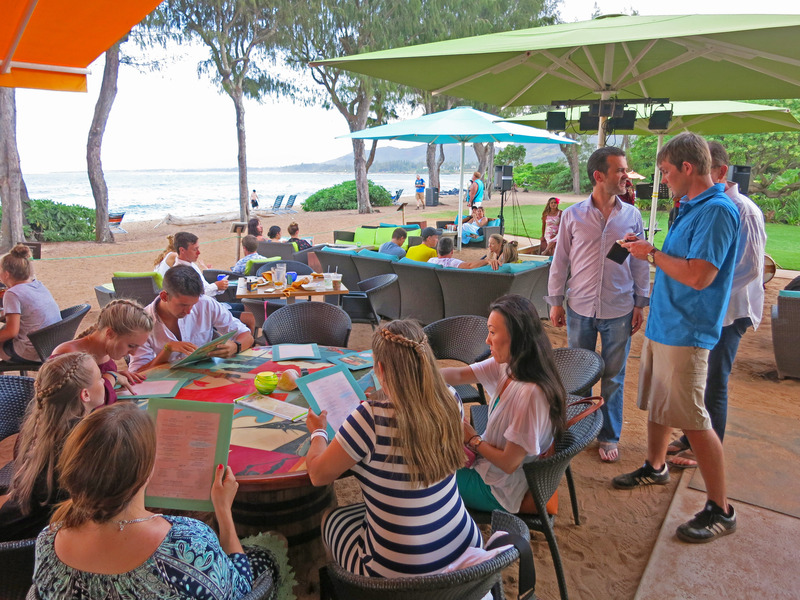 Also, click here for a map of interesting places in Kauai. FIRST -> Two movies, the first one is a boat tour of the Caves of the Nā Pali Coast of Kauai. Click here for the highest quality original. 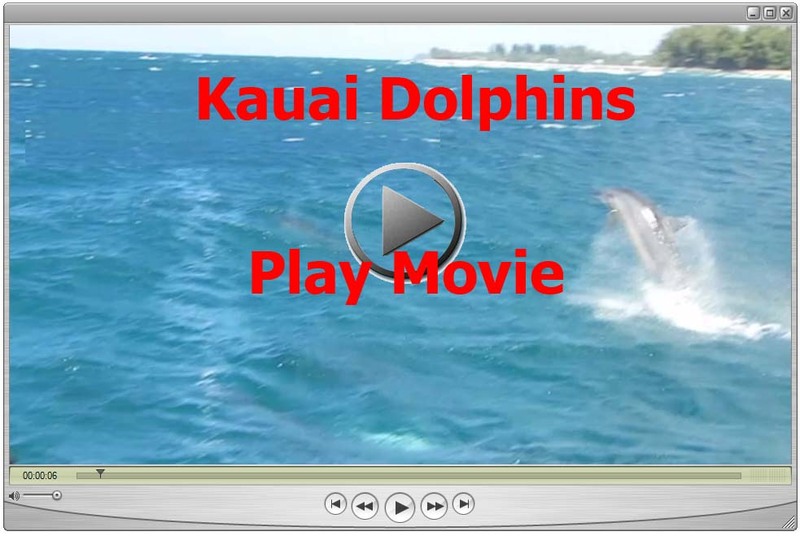 The next movie is some dolphins we saw on our boat tour. Click here for the very highest quality original. 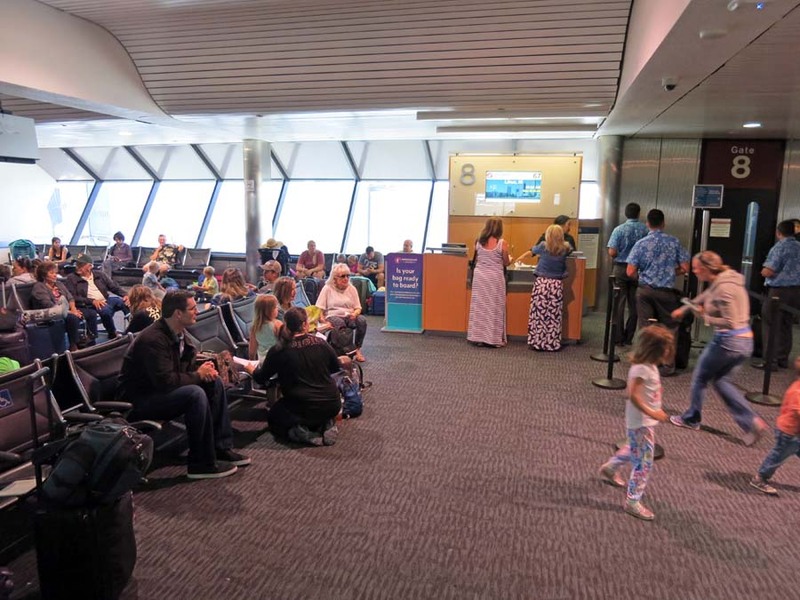 NOW IN TIME ORDER -> Below we arrive at Oakland Airport departing on Hawaiian Airlines. 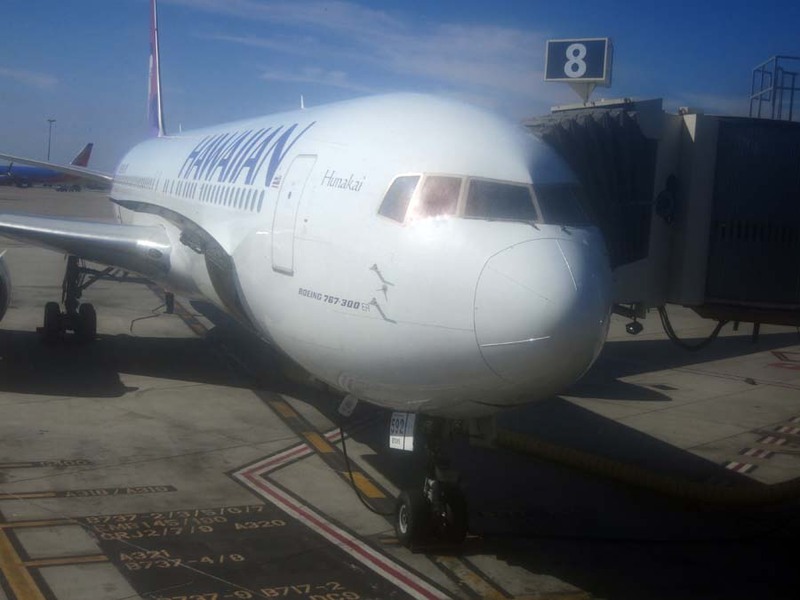 The airplane we fly in is pictured below, it is a boeing 767-300 with a name Hunakai (Number N592HA ). 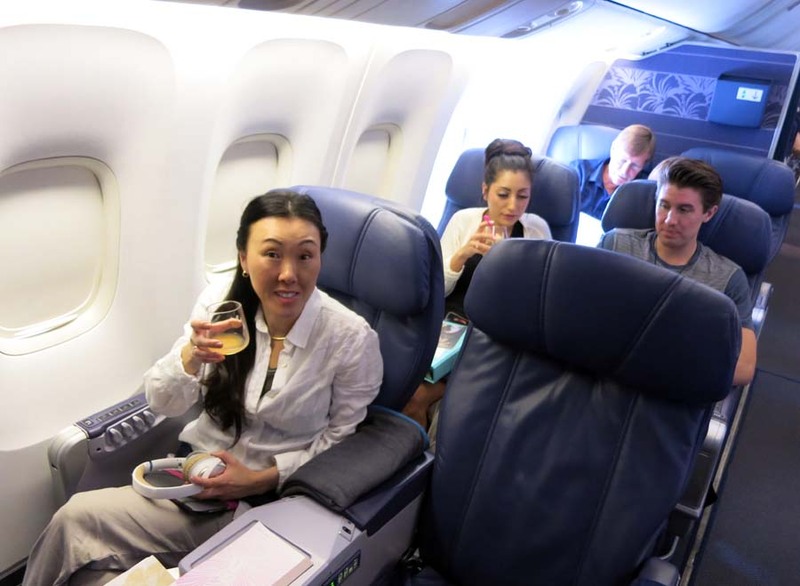 Katherine sitting in first class drinking a Mai Tai. The flight is a direct non-stop to Lihue Airport in Kauai, Hawaii. 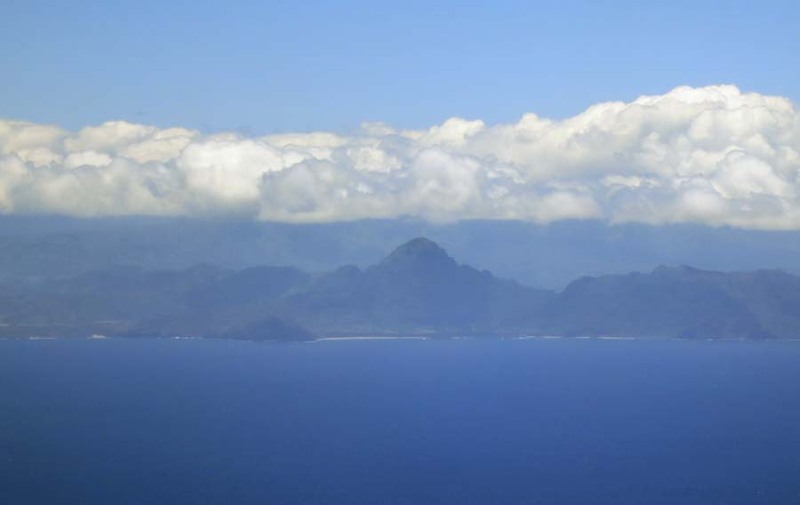 Below is our first glimpse of Hawaii from the airplane. 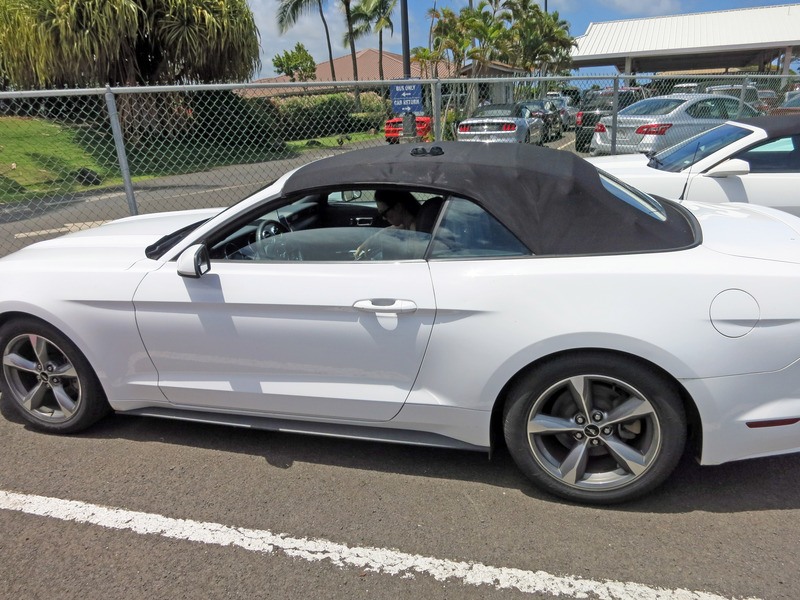 We rented a convertible as something fun to toodle around in. Below Katherine is getting situated and we put the top of the convertible down. 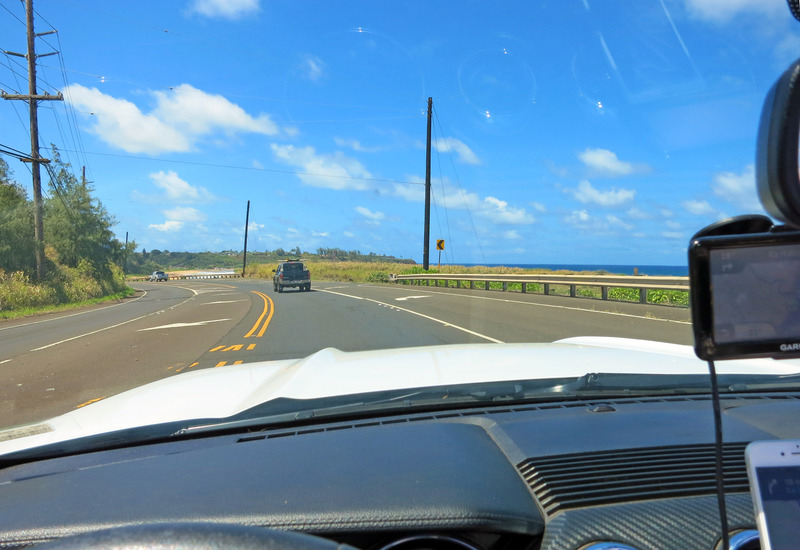 Heading north in the convertible to the northern shore (Princeville area) of Kauai. Still heading north in the car. 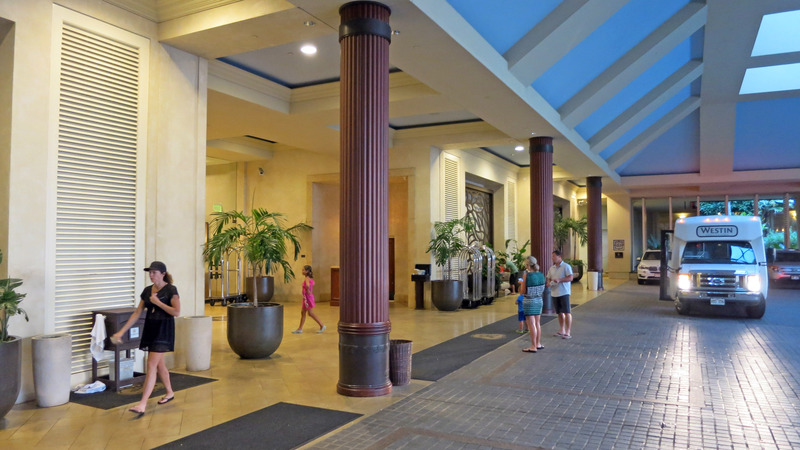 Arriving at the St Regis in Kauai (see below for front entrance). 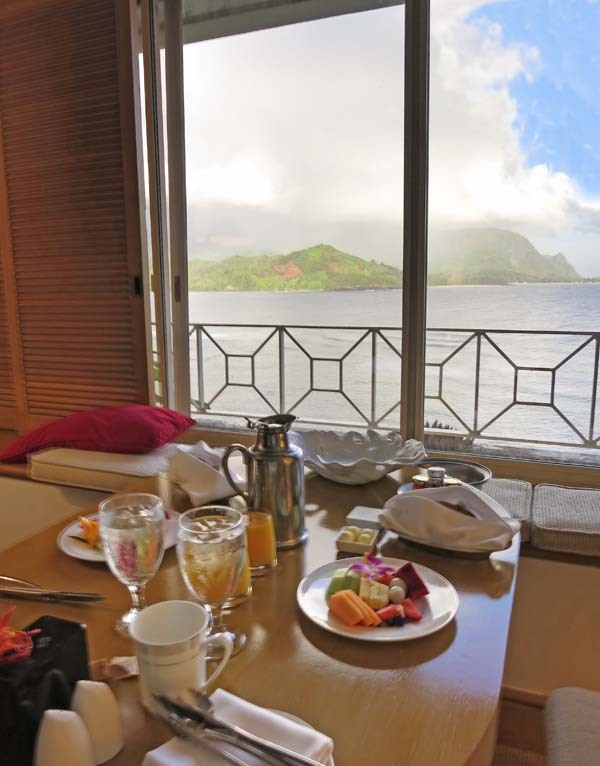 Below is a picture taken from our room 1103. 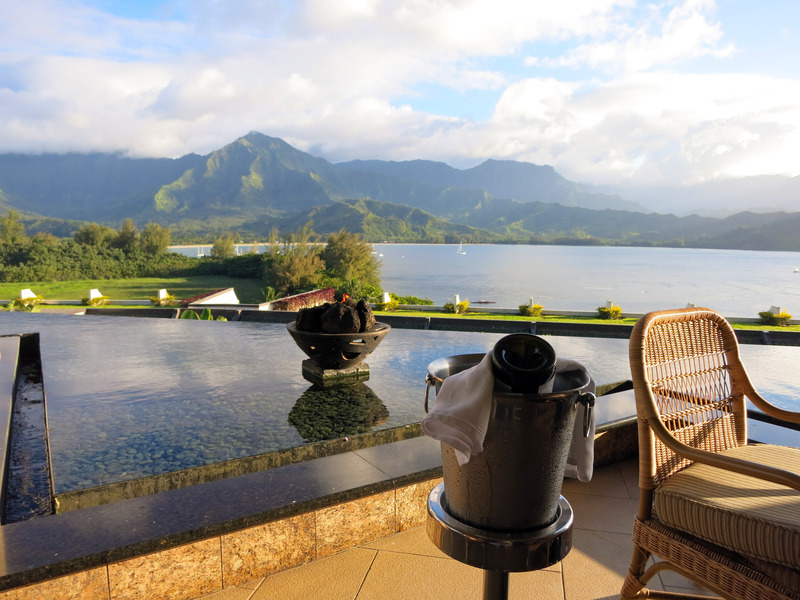 This is a "Prince Junior Suite" at the St Regis in Princeville Kauai. 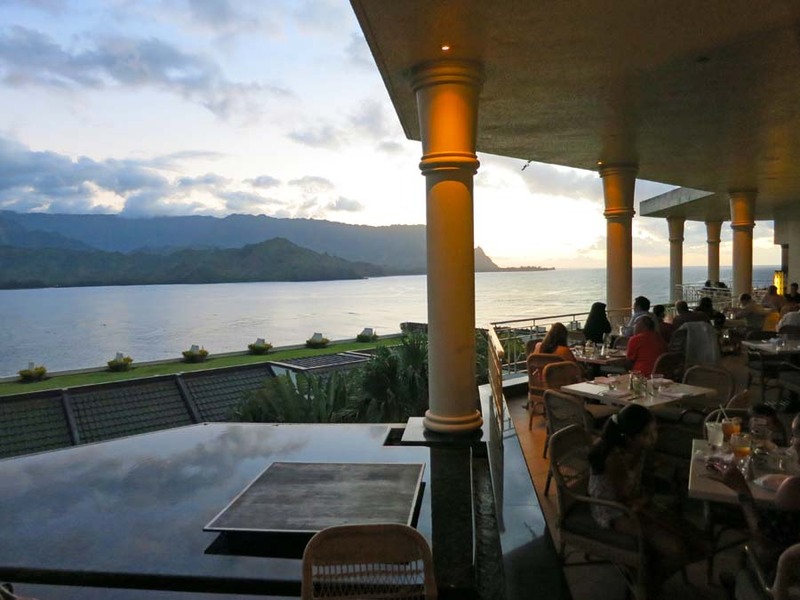 The view from the Makana Terrace in the St Regis hotel. 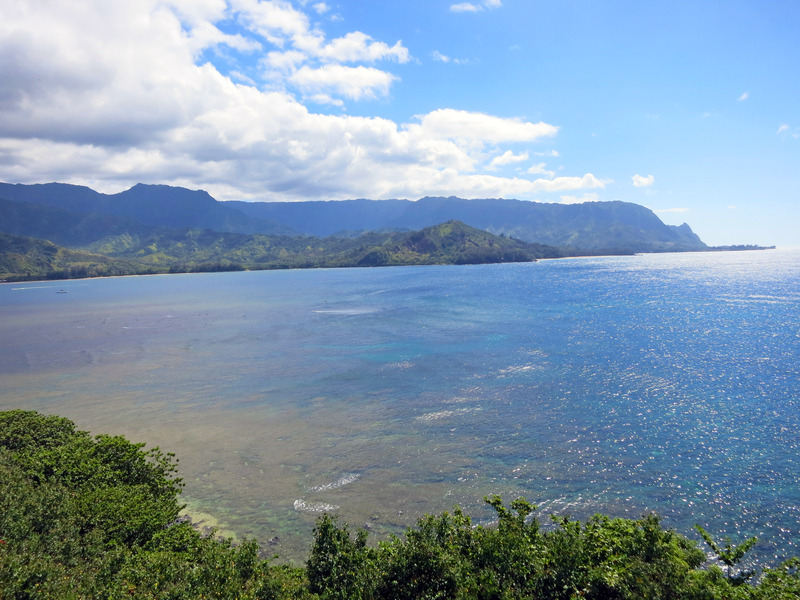 The sailboats in the distance are in Hanalei Bay, Kauai. As the sun sets we walk away. 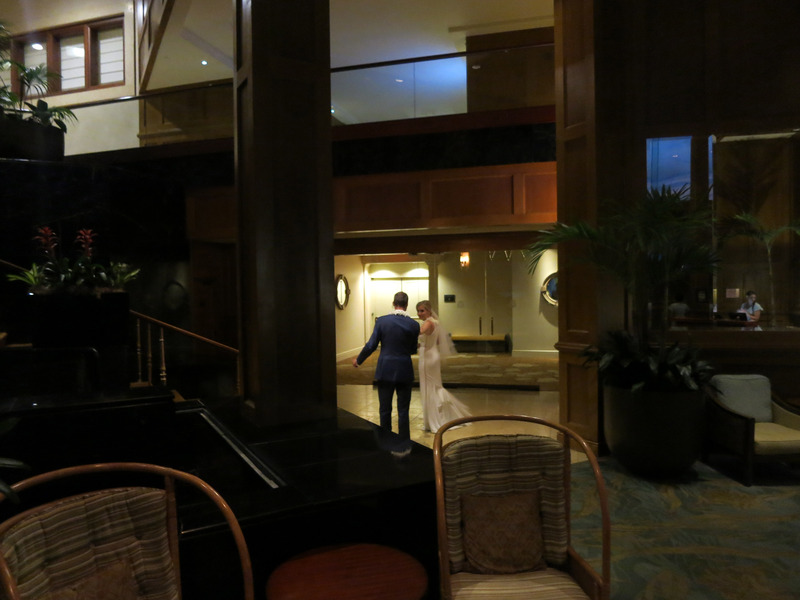 As we leave dinner, we ran into this couple who just got married Friday, July 14th, 2017 in Kauai and were practicing their dance outside the reception area. 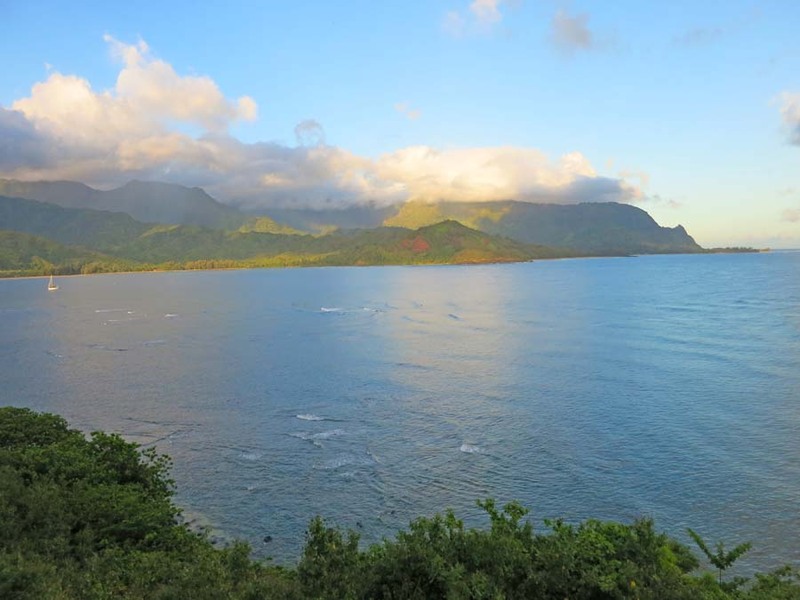 The next morning, sunrise over Hanalei Bay view from our room 1103 in the St Regis Hotel in Kauai. This is July 15, 2017. A zoomed in picture from our hotel room of some Stand Up Paddleboarders (SUP) in Hanalei Bay. 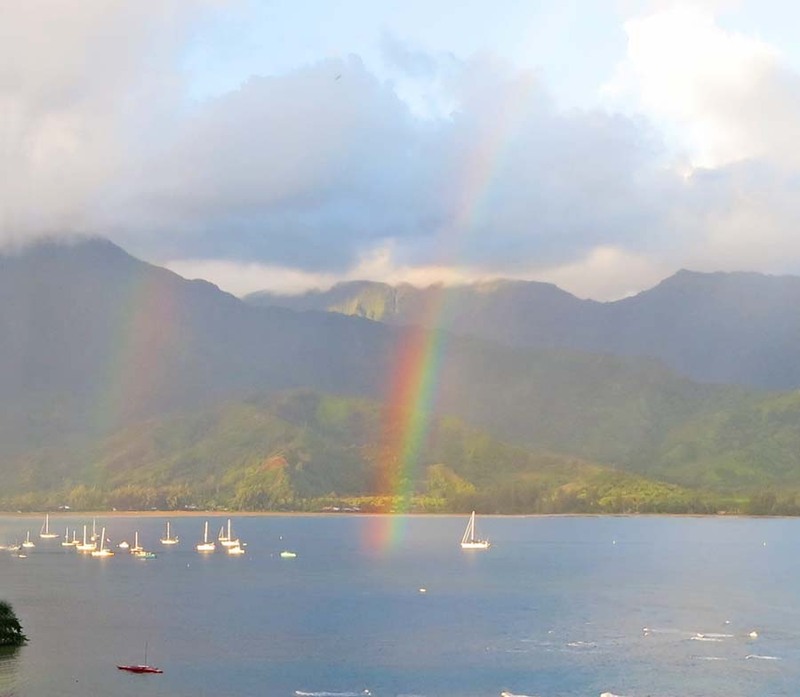 A morning double rainbow ending in the boats in Hanalei Bay. 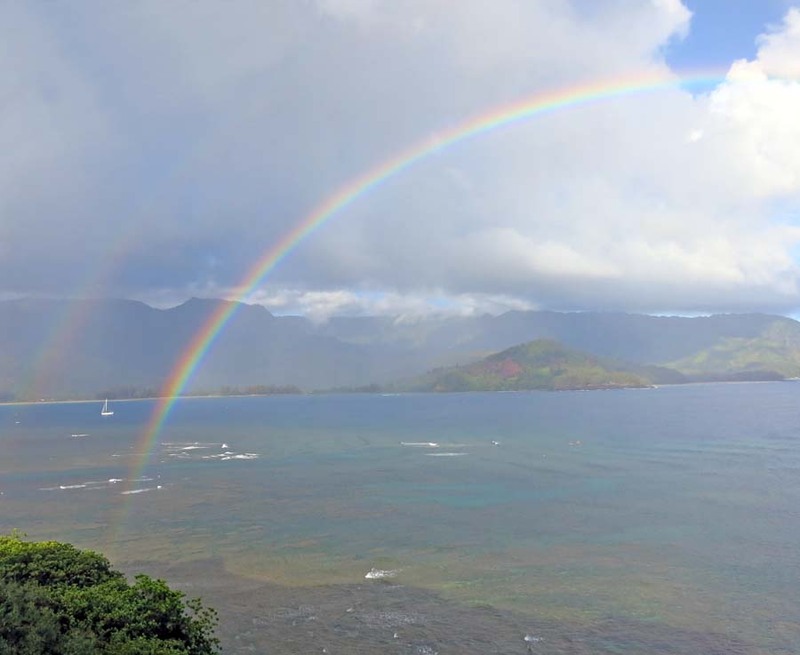 A zoomed out picture of as much of the rainbow ending in Hanalei Bay, Kauai. 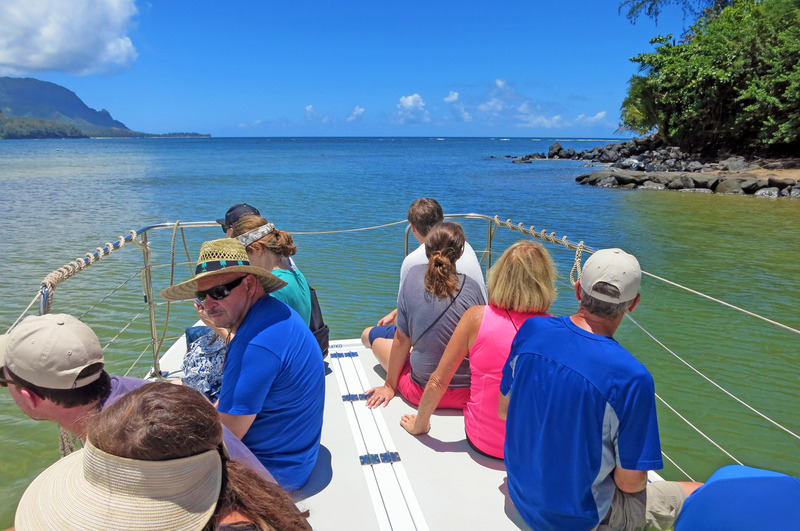 At 1pm we arrive at the back of the Tahiti Nui restaurant in Kauai to take an afternoon three hour boat trip. 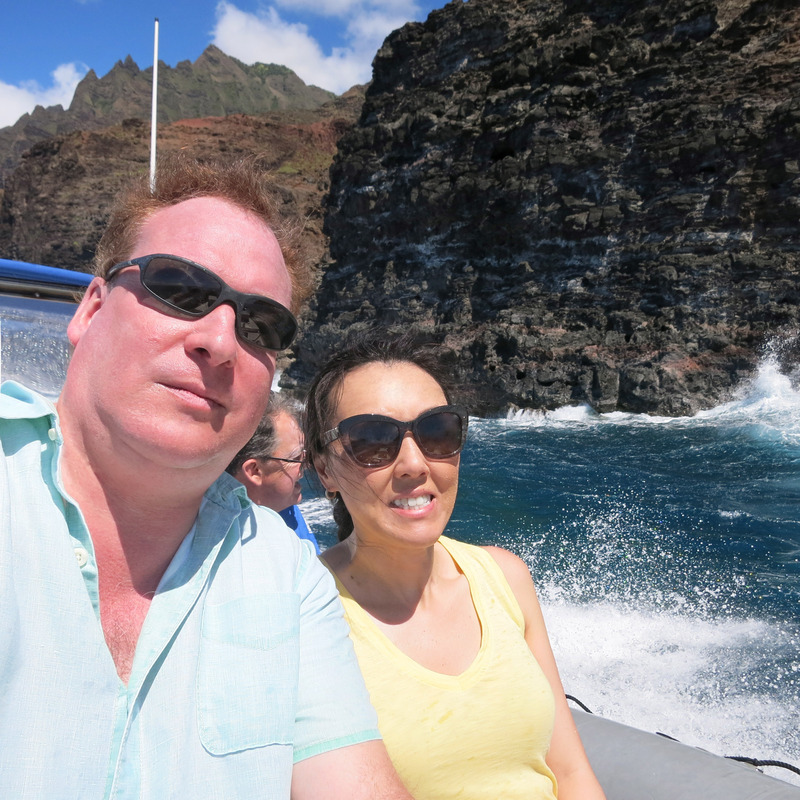 We went on a boat tour of the caves on the Nā Pali Coast. 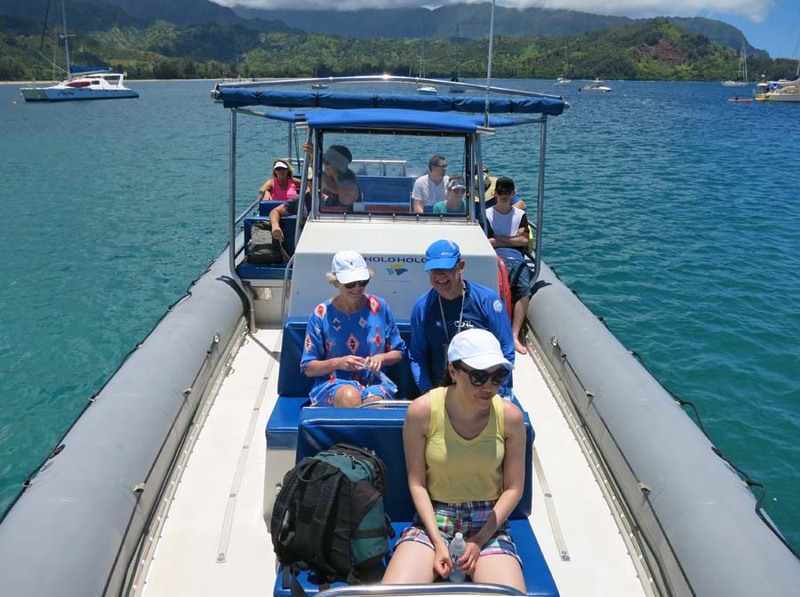 The tour operator is Holo Holo Kauai Boat Tours. We aren't allowed to wear shoes on the boat, so we leave out shoes in these containers on the back of the van. 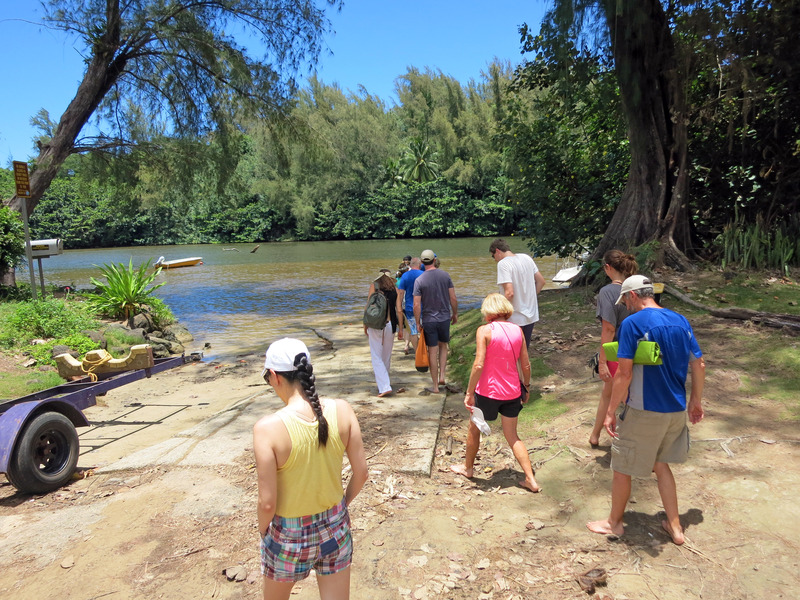 We walk barefoot to the shuttle which takes us out to the larger boat. Below is Captain Aaron of Holo Holo Charters. 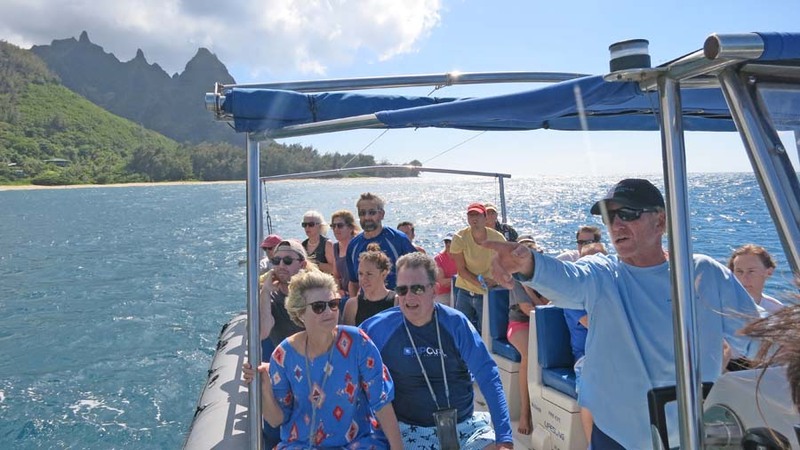 We take a SUPER shallow water craft out to the main boat. 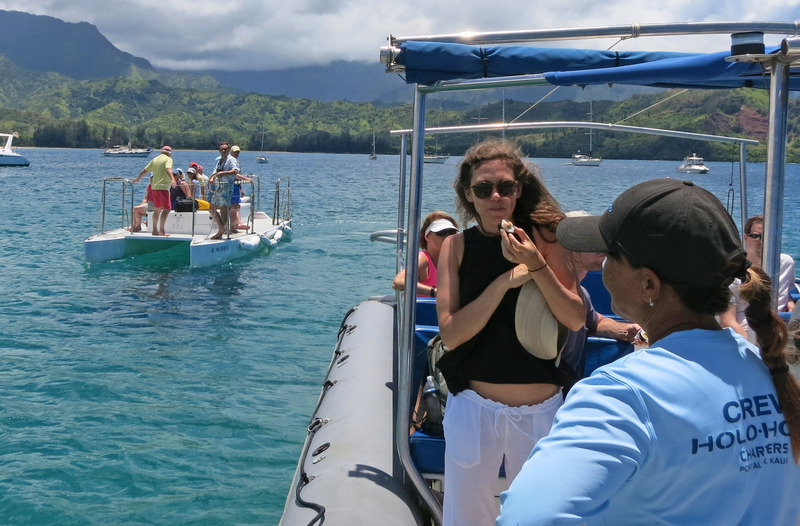 The shuttle leaving out the flat river into Hanalei Bay. The pier is just off to our left. 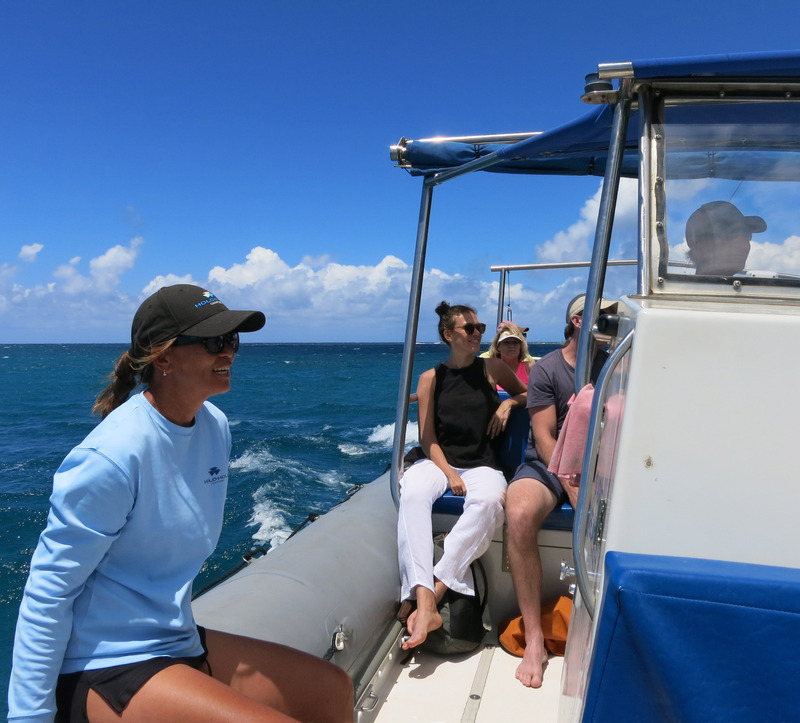 Here we are just arriving at the main boat, and we meet First Mate Claudia (in blue long sleeve shirt below). 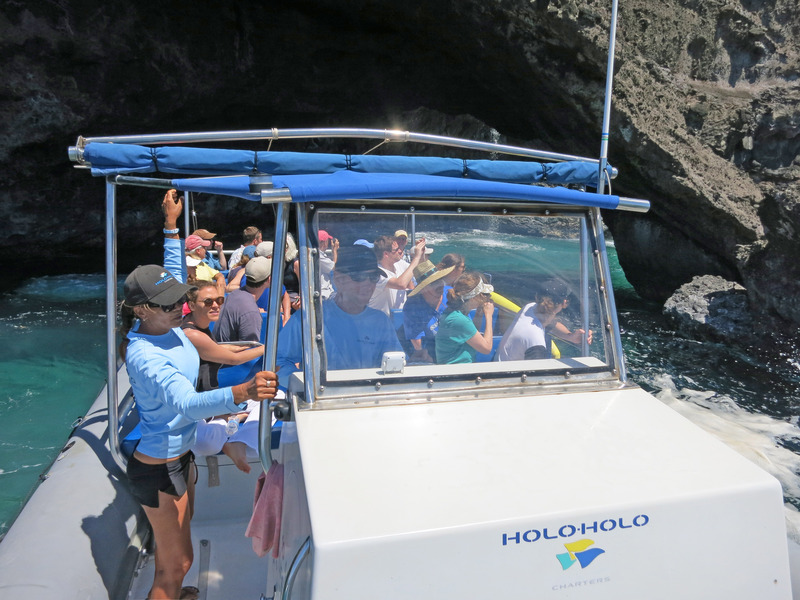 It takes two small shallow shuttles to get all 28 people on board our boat. So as we wait for the second shuttle I take a picture of the main boat we will ride on for the next three hours. 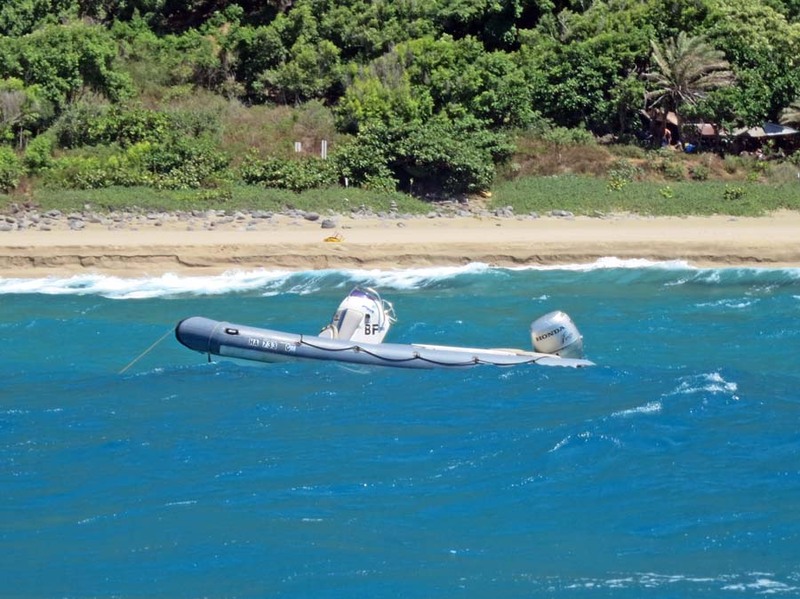 It is a RIB (Rigid Inflatable Boat). 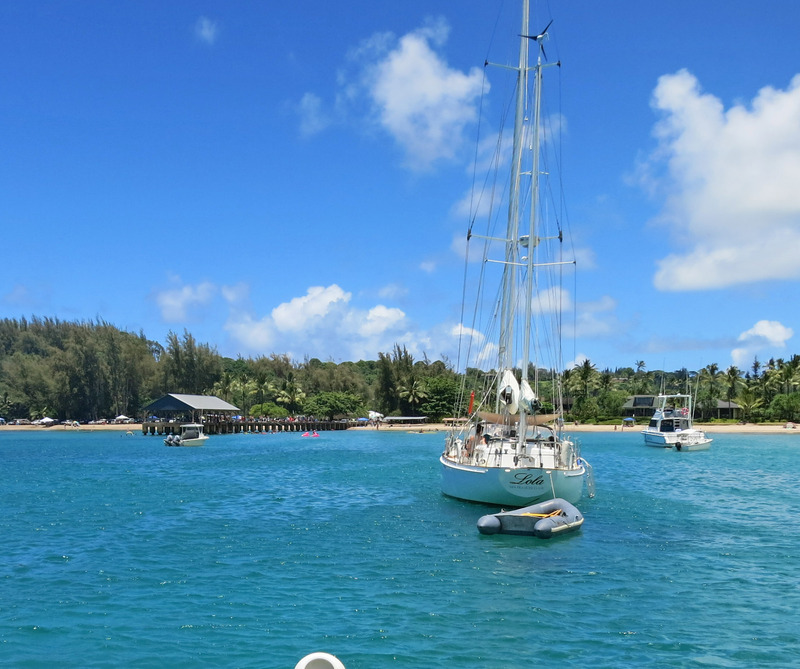 The deck and V-hull is fiberglass, and the surrounding walls are inflatable like a Zodiac raft. 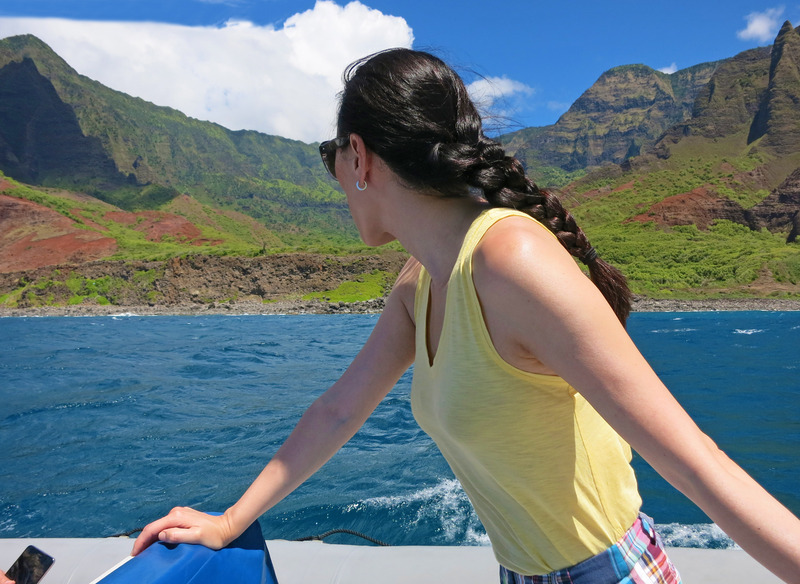 Katherine and I sat in the front of the boat. 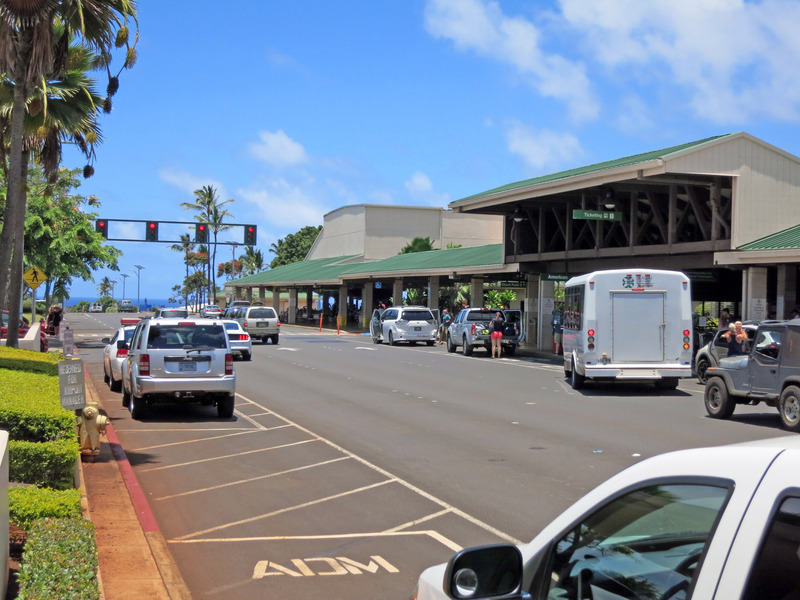 While waiting, a picture of the Hanalei Pier in Kauai plus a boat that has JUST sailed over from San Francisco. This is the Lola is a 33 foot sailboat from San Francisco. The final shallow shuttle arrives. 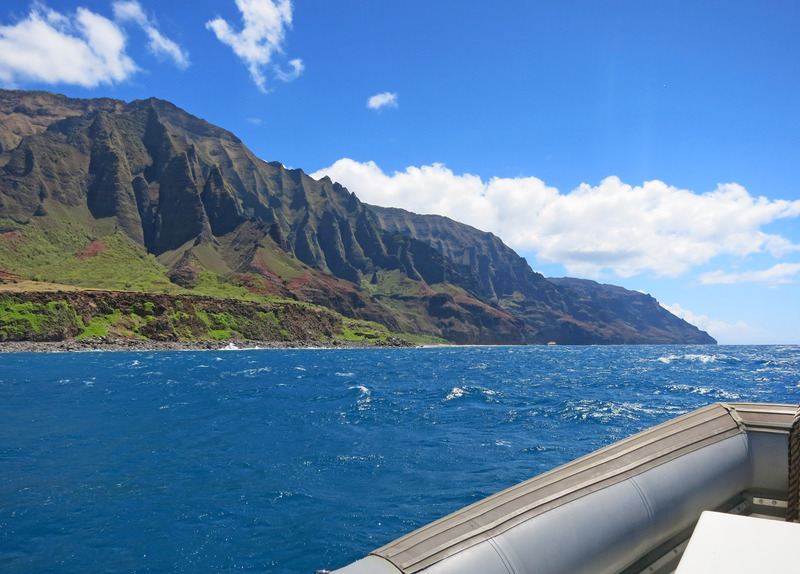 We head north along the Nā Pali Coast. 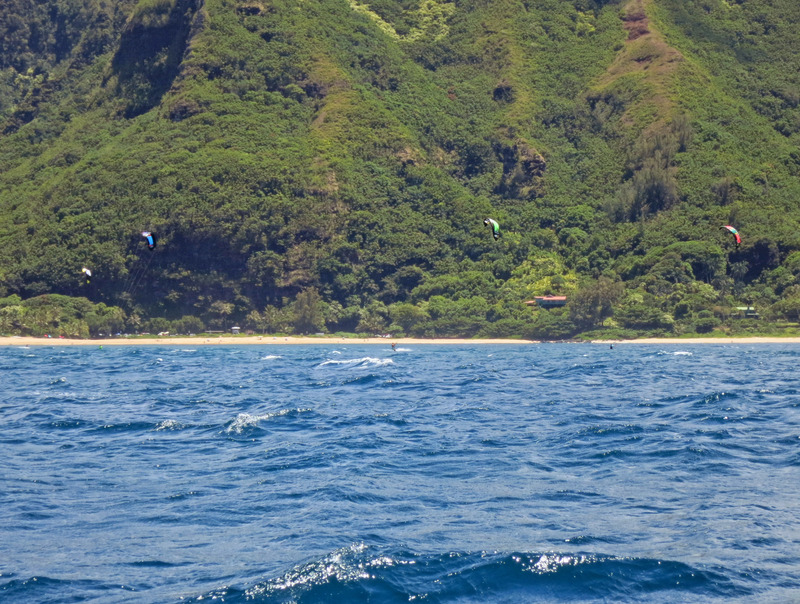 We see the kite boarders below. A close up of the Kite Surfers. Some people on the beach. 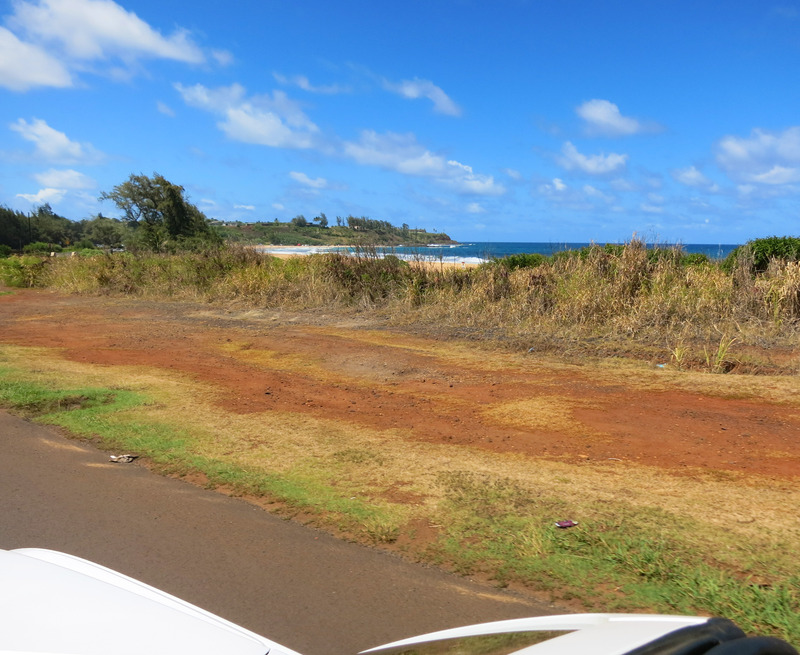 The beach below might be "Ke'e Beach" at the very end of the road. 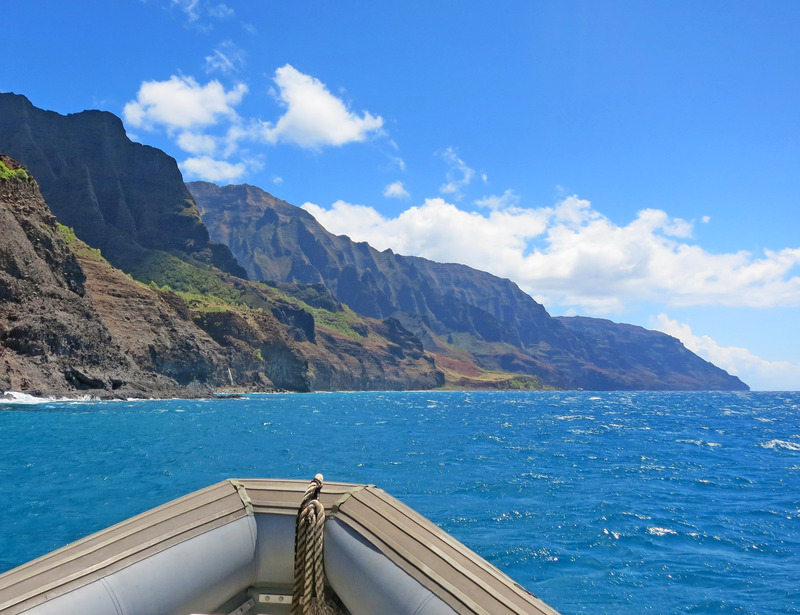 And we head into the rugged Nā Pali Coast of Kauai. Here is a 10 minute video boat tour of the Caves of the Nā Pali Coast of Kauai. Click here for the highest quality original. Below is the rugged Nā Pali Coast of Kauai. 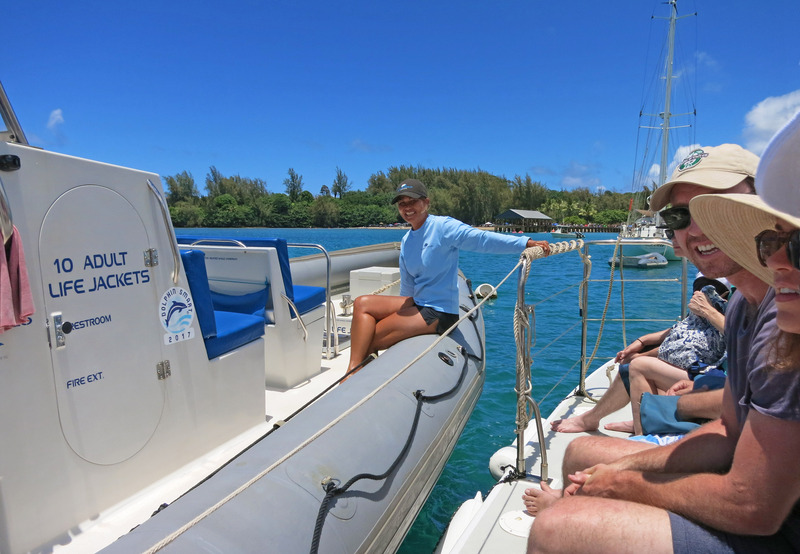 First Mate Claudia (on left smiling). Captain Aaron is behind the windshield in a baseball cap. 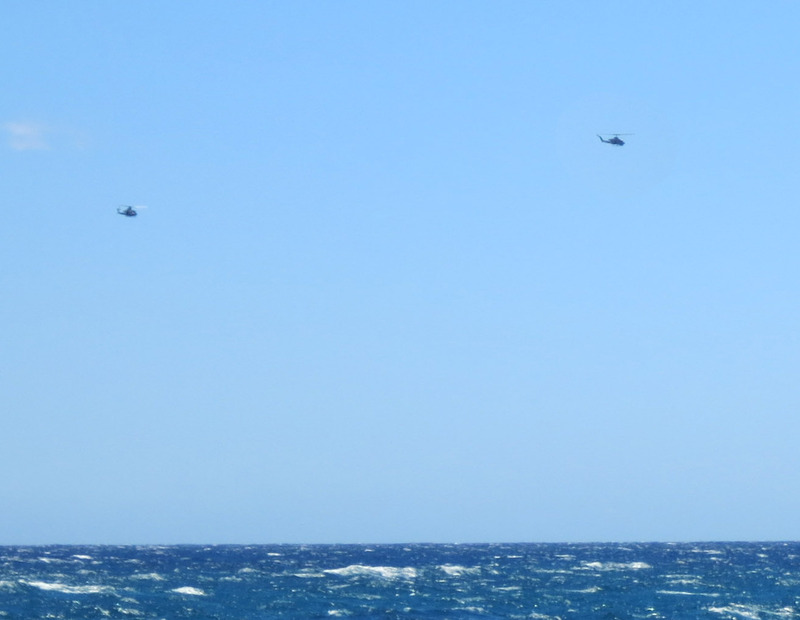 There are helicopter tours of this area that go by every twenty minutes or so. Below are a couple in one photo. 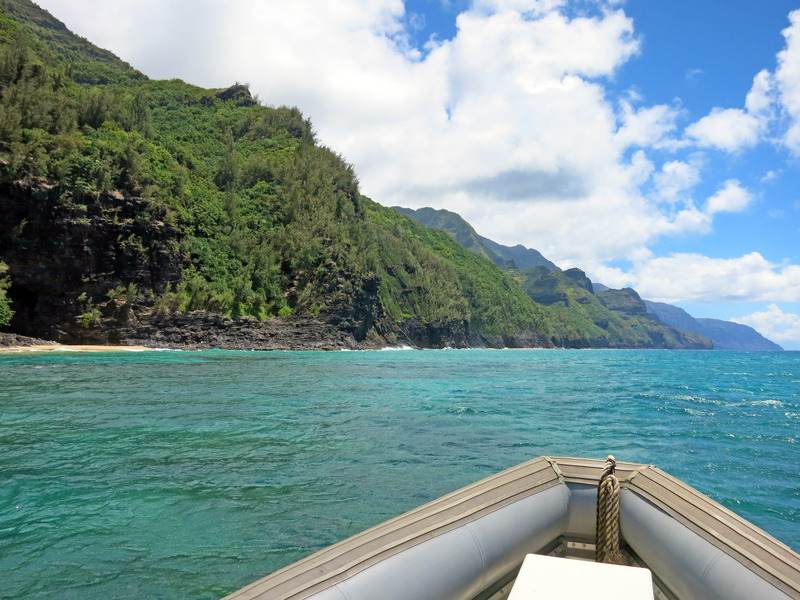 The Kalalau Trail goes from the end of the road up around the northern part of Kauai along the Nā Pali Coast. Camping and access is by permit only to limit the crowds. 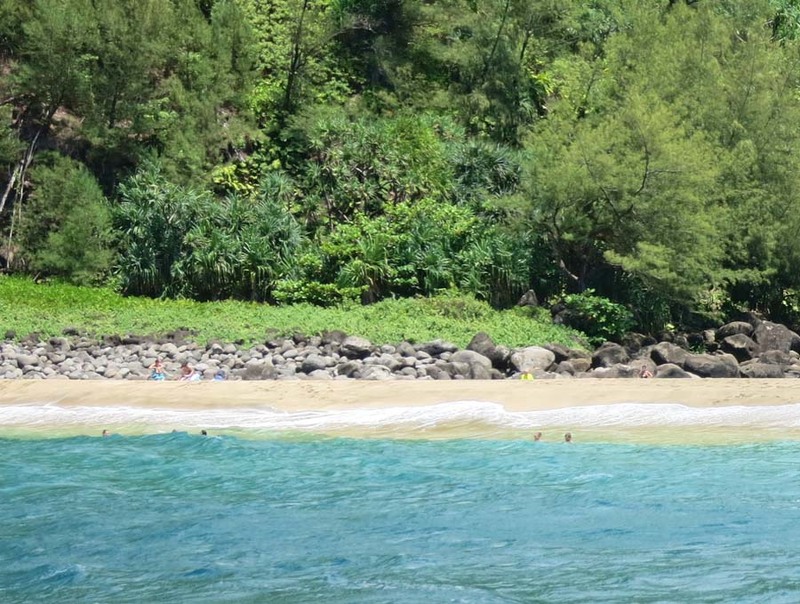 Below are some people who have walked at least part of the Kalalau Trail and are going swimming in the ocean. 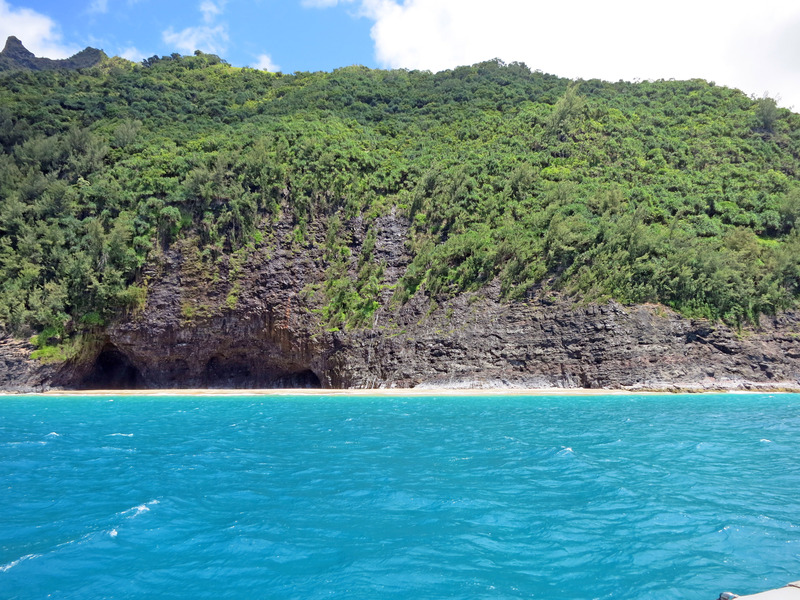 A tall overhanging cliff and some sea caves on the Nā Pali Coast. 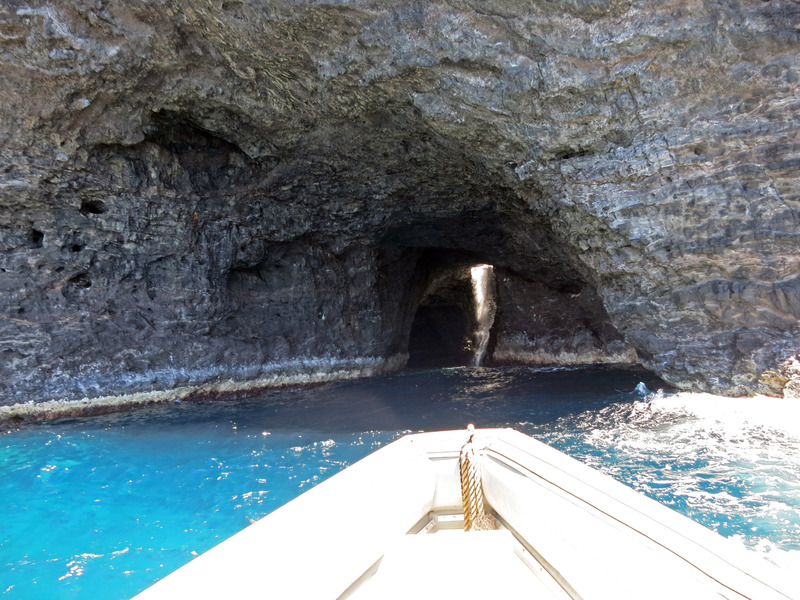 Here our captain (Aaron) drives our boat into a cave. Further up north a VERY vertical peak (far upper left corner). 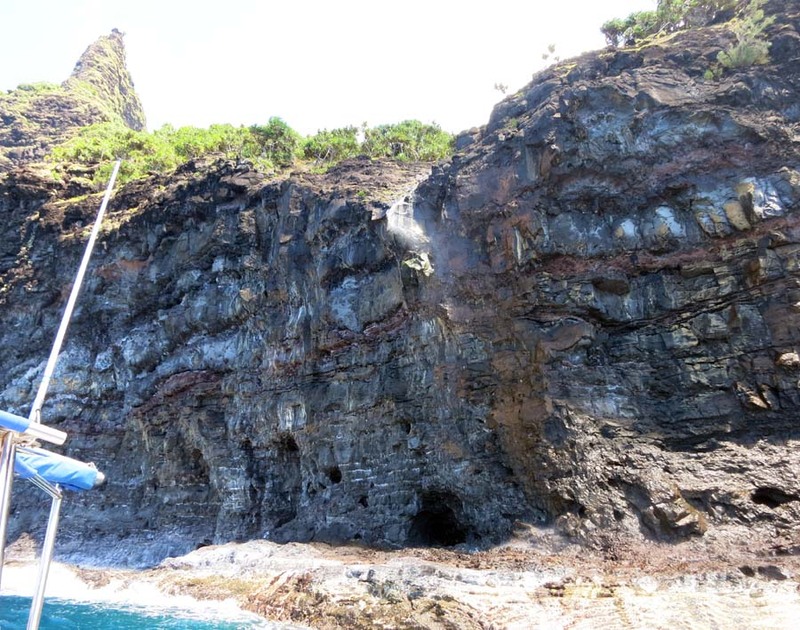 The picture below is a "very classic photo" of the rugged Nā Pali Coastline. 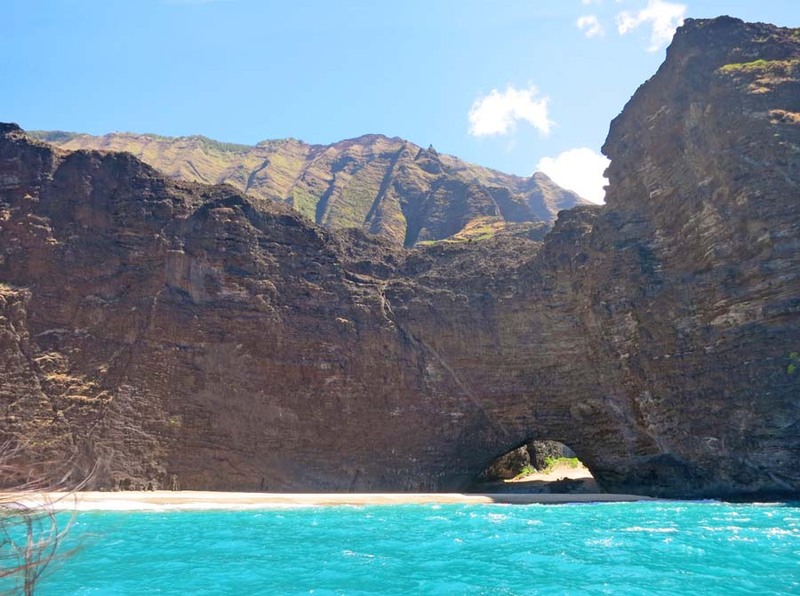 A rock arch on the Nā Pali Coast. 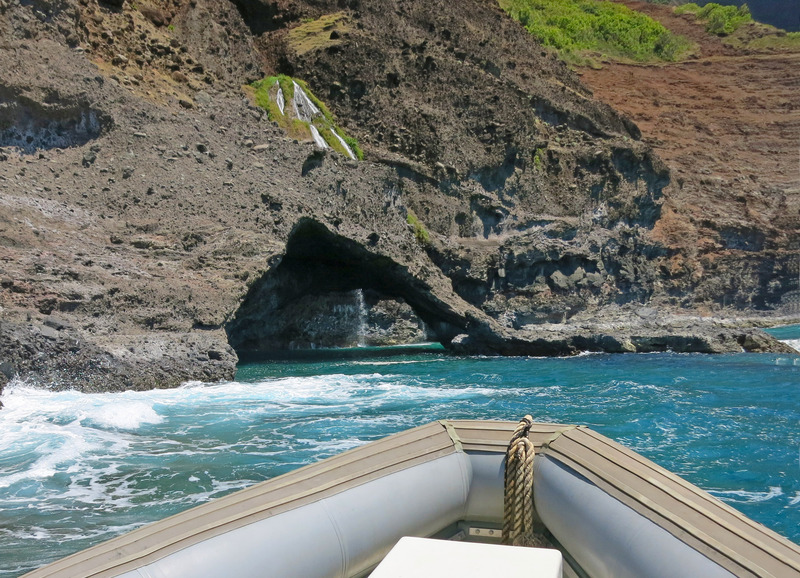 We took our boat under the arch. Here First Mate Claudia (blue long sleeves far left of photo) helps direct Captain Aaron to back the boat up under the arch. Backing up under the arch. Katherine looking at the coast behind her. 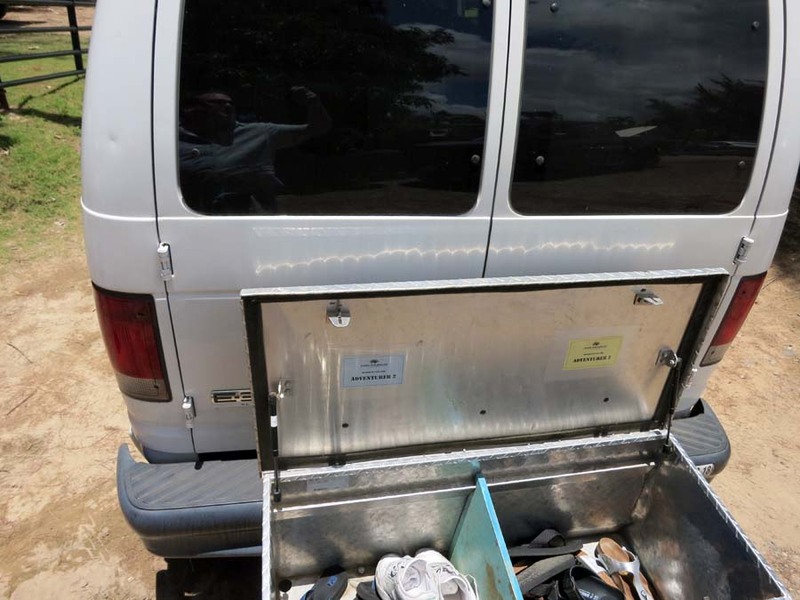 The boat below is a small, center console inflateable. 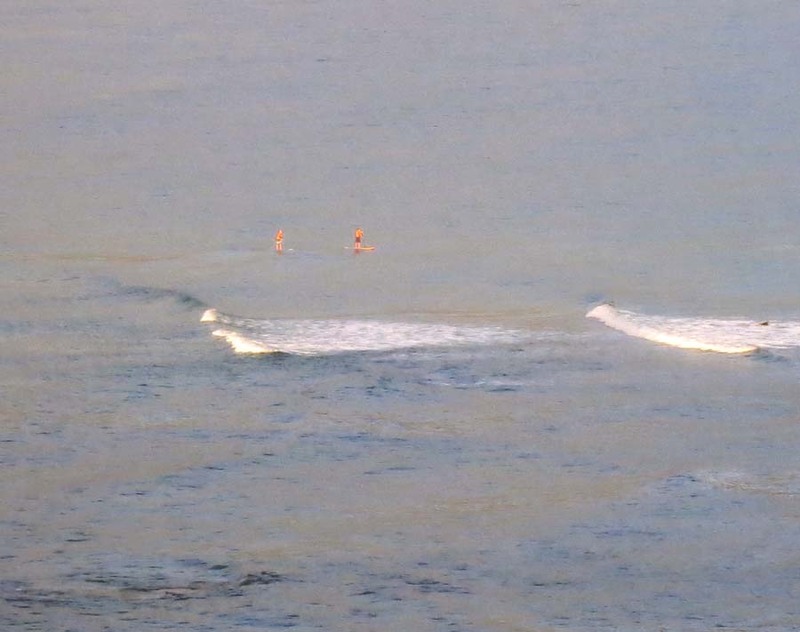 I think it's a cool, fun looking boat I would love to play with in this water. 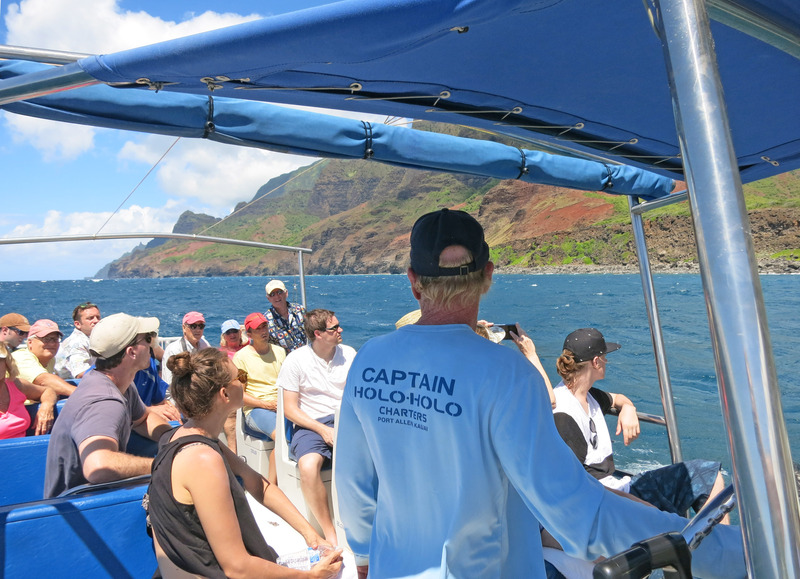 Captain Aaron sports his "CAPTAIN HOLO-HOLO Charters" long sleeve T-shirt and talks with tour members. 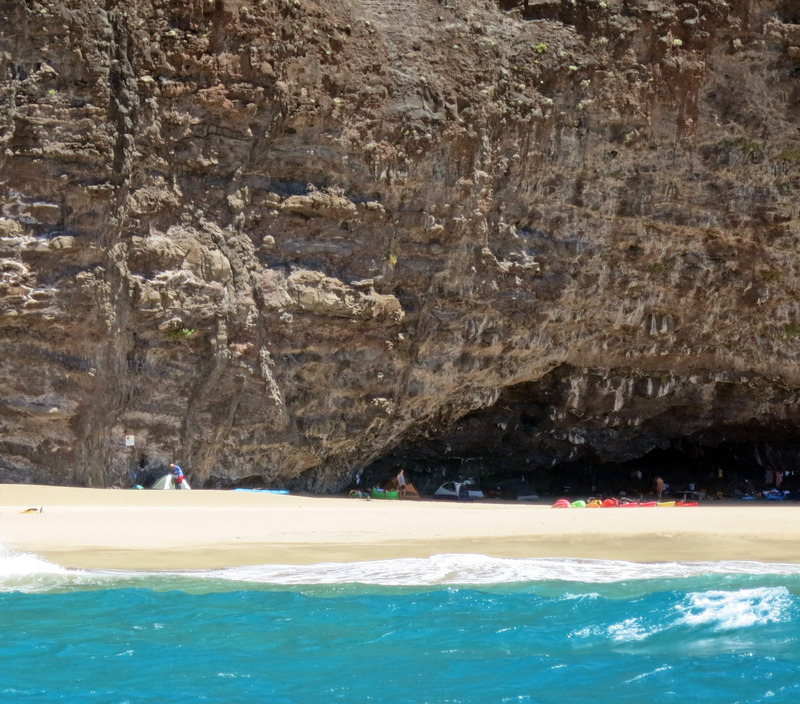 Some campers up near the very end of the Kalalau Trail. 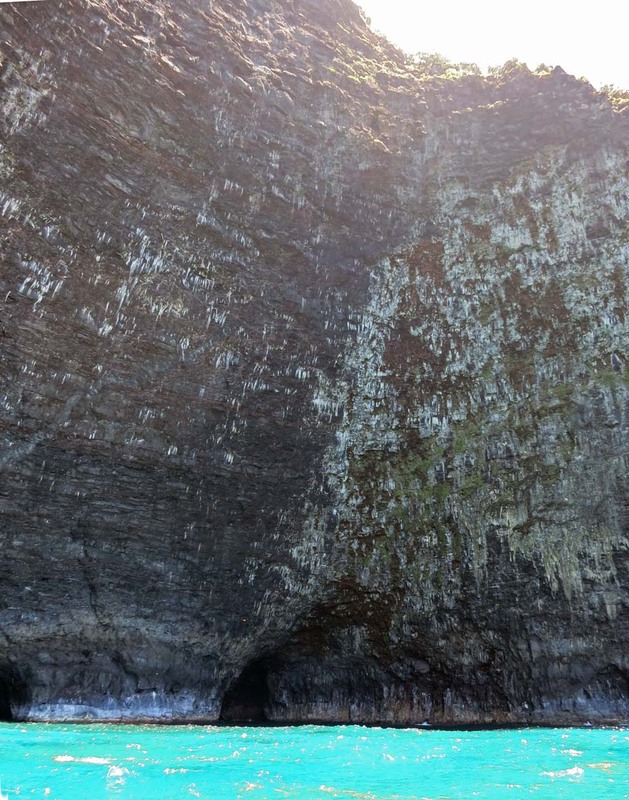 They tuck their tents and stuff up under the cliff so when it rains they don't get wet. They might camp here for a week then return to civilization. 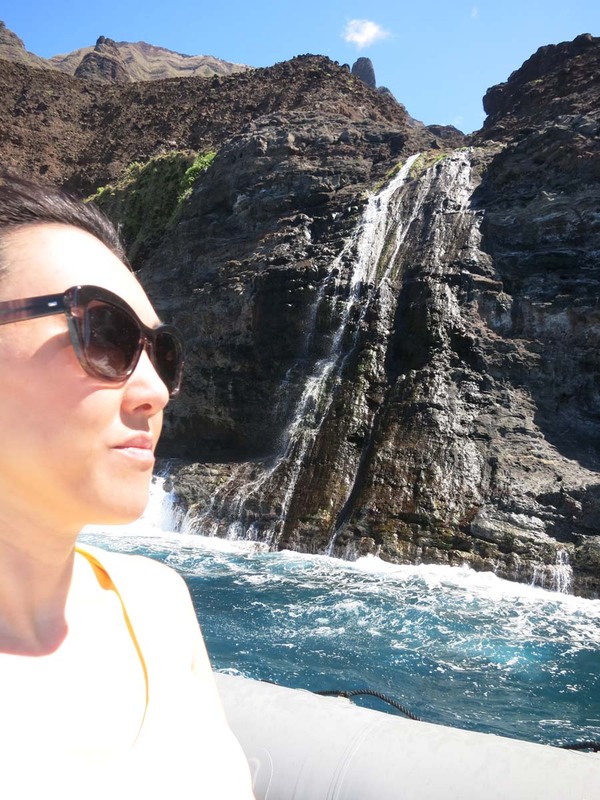 The arch below is called the Honopū Arch and behind it is the Honopū Valley. 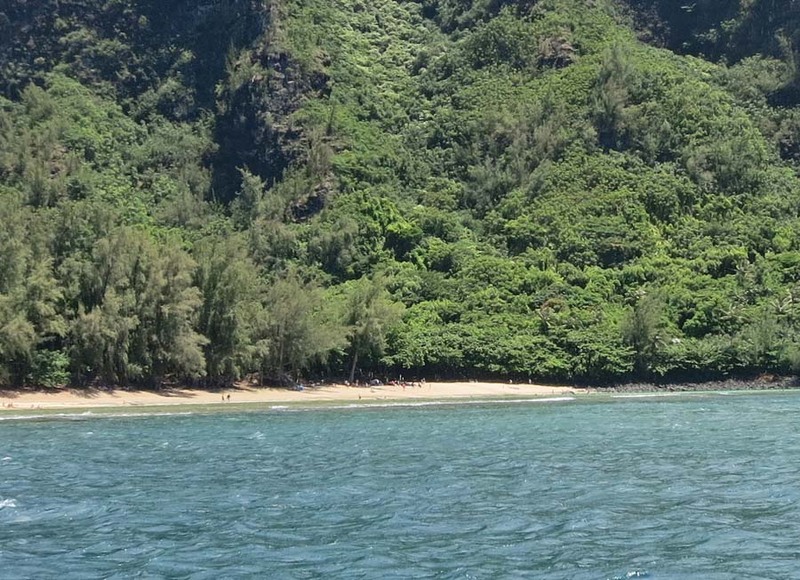 No boats are allowed to land on this beach, but visitors ARE allowed to swim onto shore. 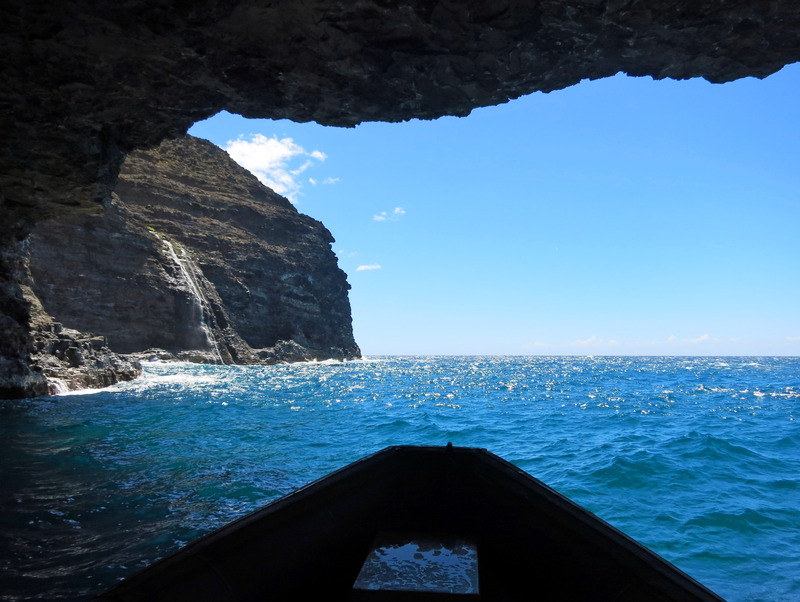 Here we are inside ANOTHER cave with our boat. 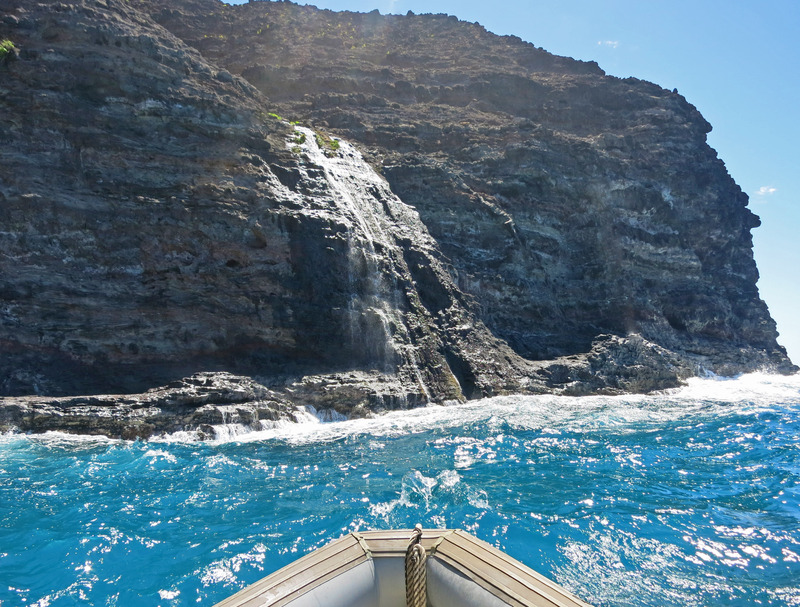 In the picture below, a pretty waterfall flows down outside the rocks. 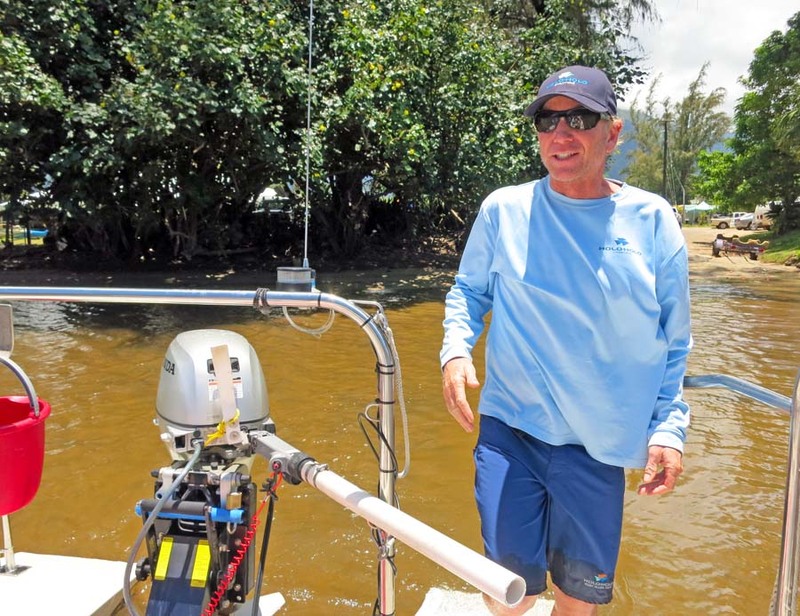 Fresh water flows year round on the island of Kauai, there are no water shortages despite having no snowpack and being a tiny island. Katherine in the foreground and a waterfall behind her. A selfie of Brian (me) and Katherine. 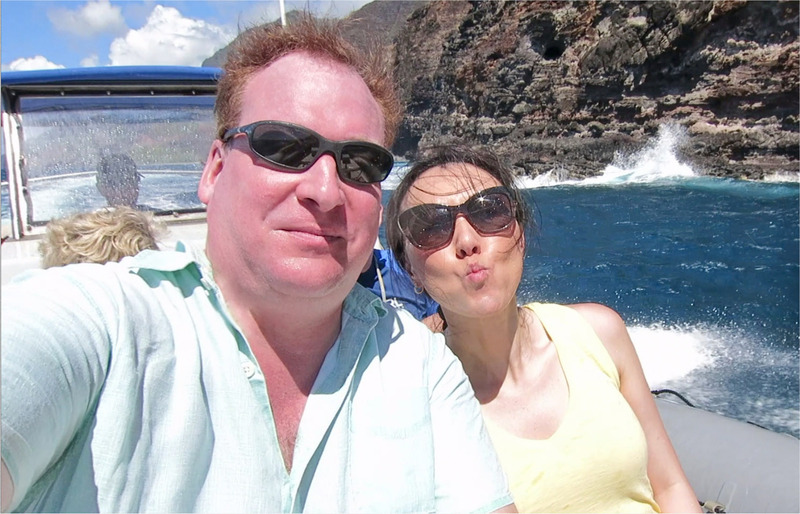 Anther selfie of Brian (me) and Katherine making a kissy face. 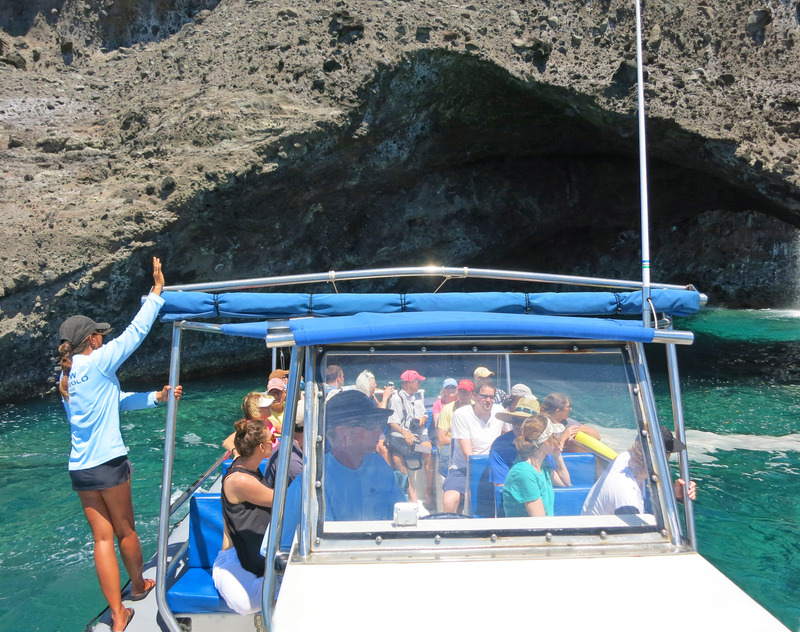 On the return trip home, Captain Aaron points out some features on land. On the return trip back south to Hanalei Bay, we notice a sea turtle. 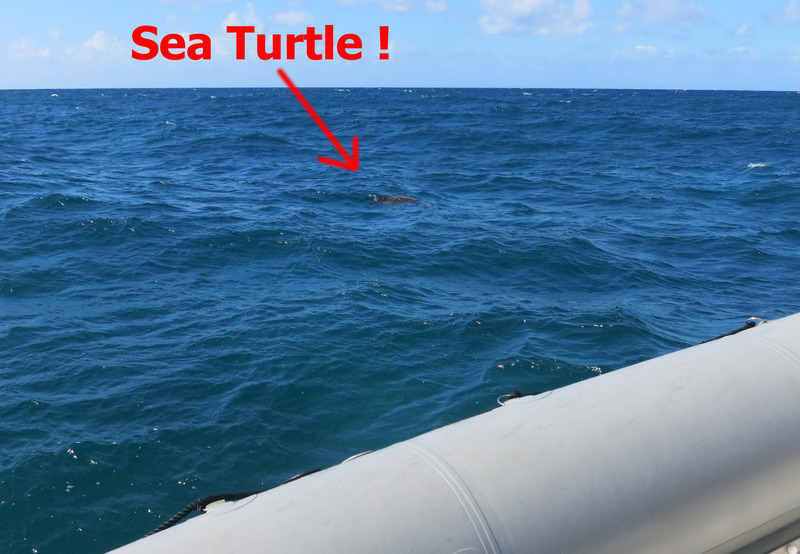 Click here for a movie of a sea turtle we saw. 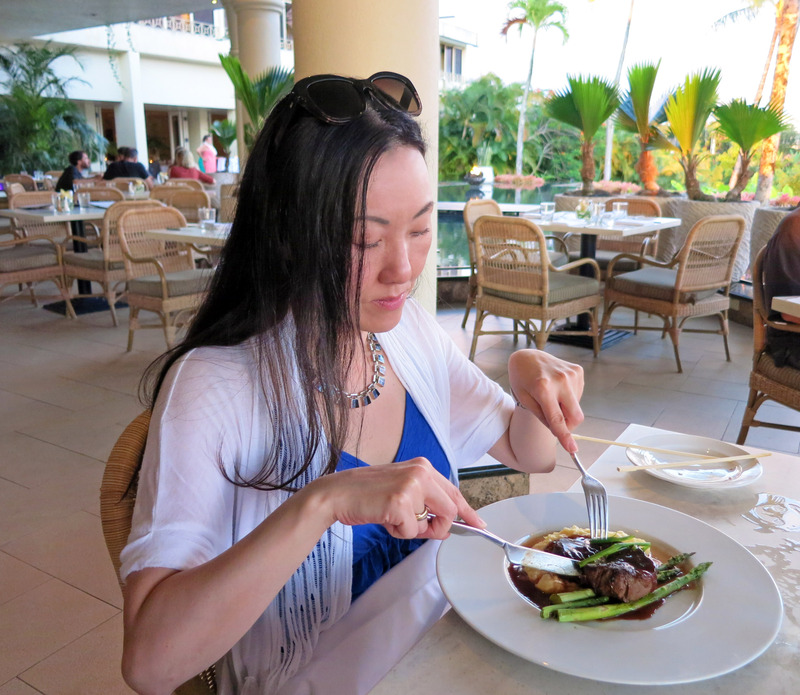 After the tour, we walked next door to the Kalypso restaurant to have a (very) late lunch. Back to the St Regis for a shower. 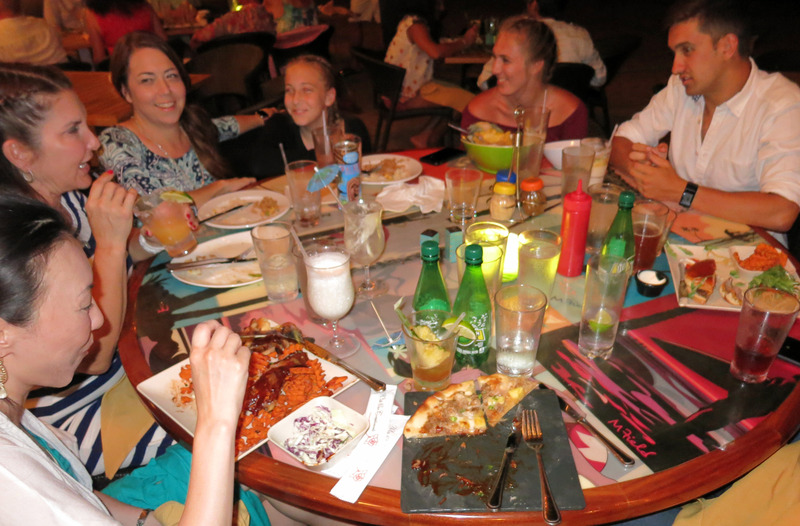 We met our friends (see below) in the "Happy Talk" Lounge Restaurant. 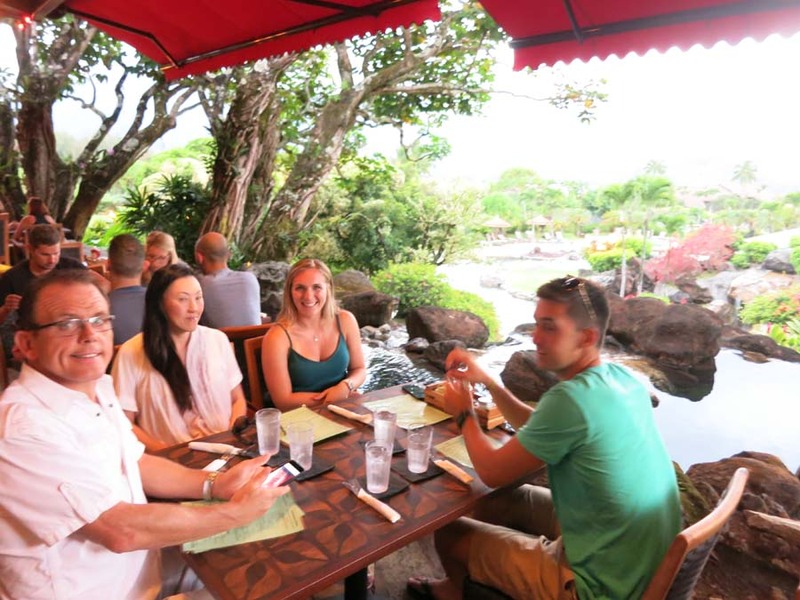 From left to right: Will MacDonald, Katherine Chung, Kendall MacDonald, and Charlie Gosling (greenshirt). 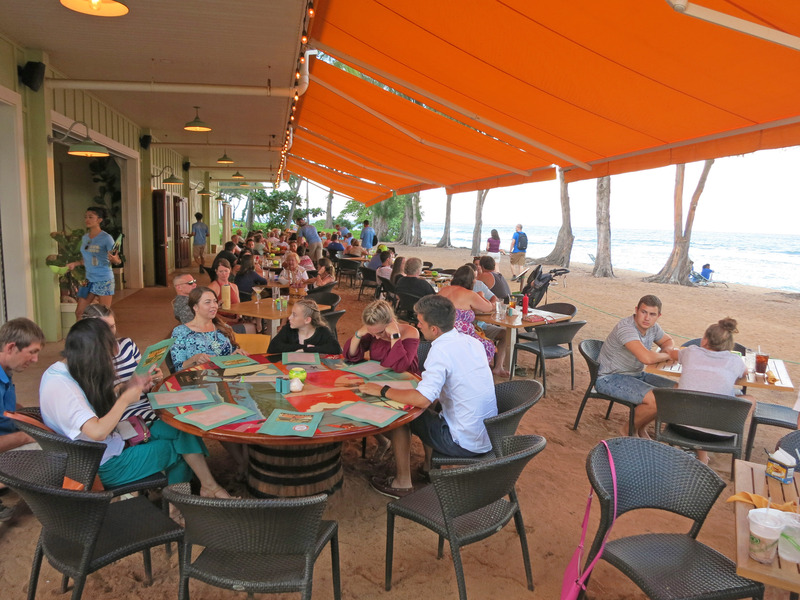 After the sun went down and we finished dinner, we walk away from "Happy Talk Lounge". 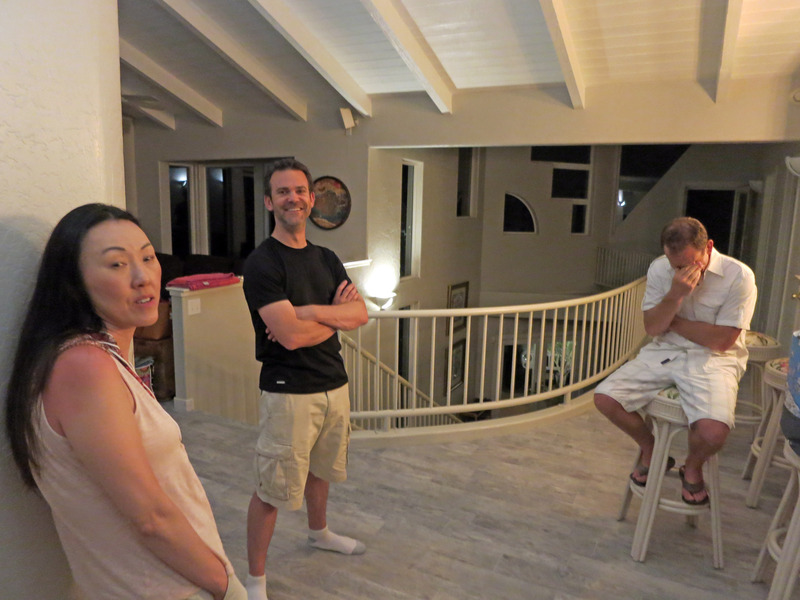 Here we are back at Will MacDonald's VRBO (they own this, but are staying there this week). Here is their very nice VRBO near Princeville, Kauai, Hawaii. Below you see Jennifer McMenamy (green shirt with oval hole in shoulder) and her daughter Brooke McMenamy with back to the pole. In the background is Kendall MacDonald. Katherine Chung, Kevin McMenamy, and Will MacDonald (in white on stool). 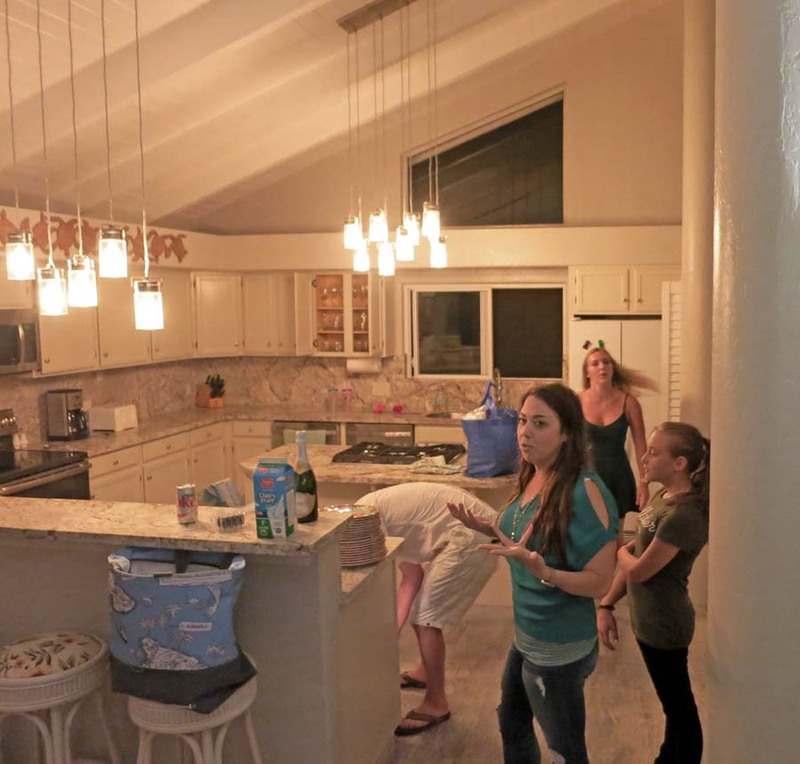 Brooke (with hat/visor), Kendall, Charlie, and Jennifer. The next morning, Katherine and I have breakfast in our hotel room 1103 in the St Regis. Below we have Pog Memosas! 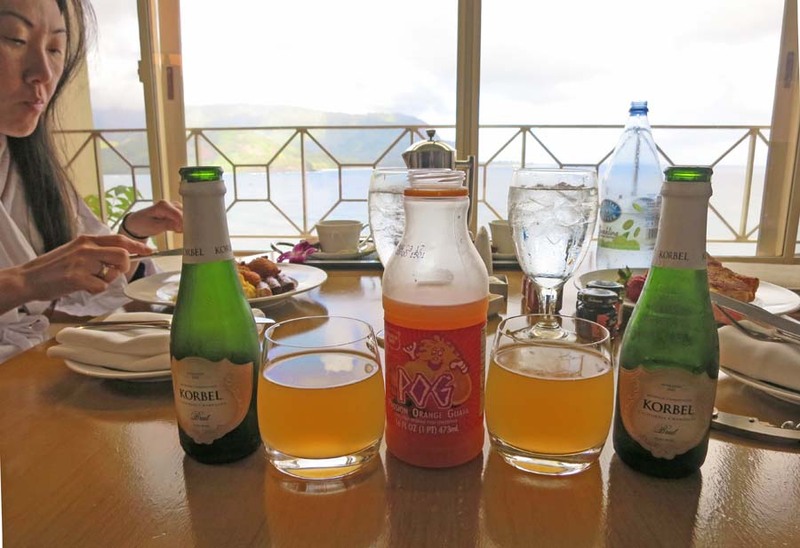 (We stopped at a store and bought these raw supplies ourselves as we originally arrived into Kauai, the hotel does not serve these.) 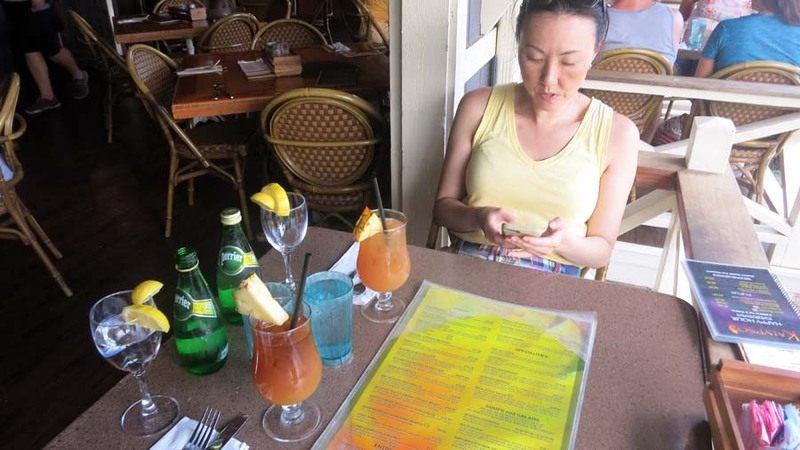 I first had Pog (P.O.G stands for Passionfruit, Orange, and Guava) in Hawaii, and it is relatively rare OUTSIDE of Hawaii. 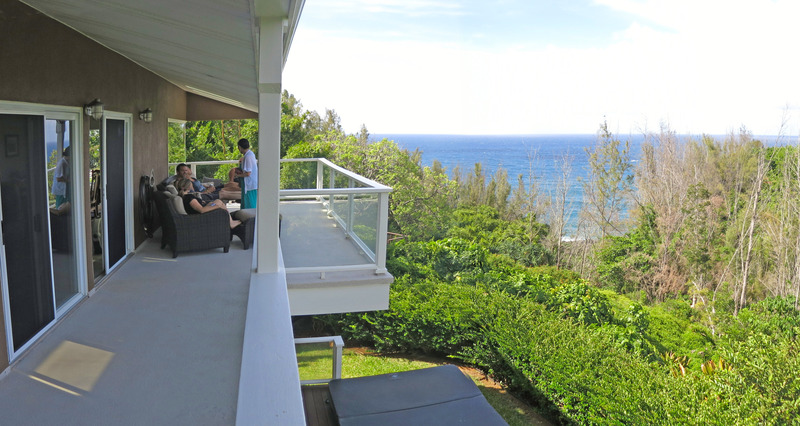 We wander over to the MacDonald Kauai house, here we are on the back deck. This wild chicken was in their back yard. 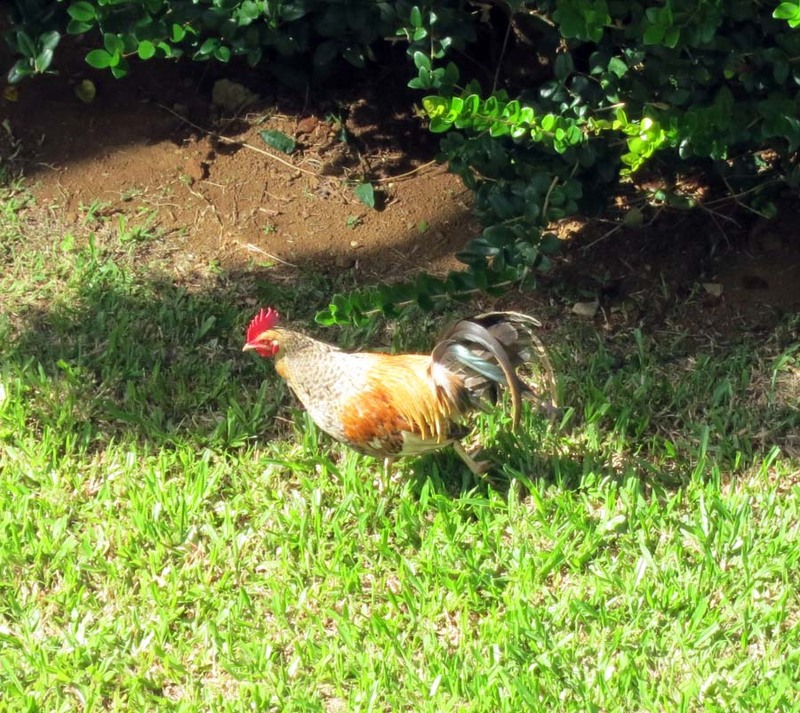 Wild chickens are EVERYWHERE in Kauai. 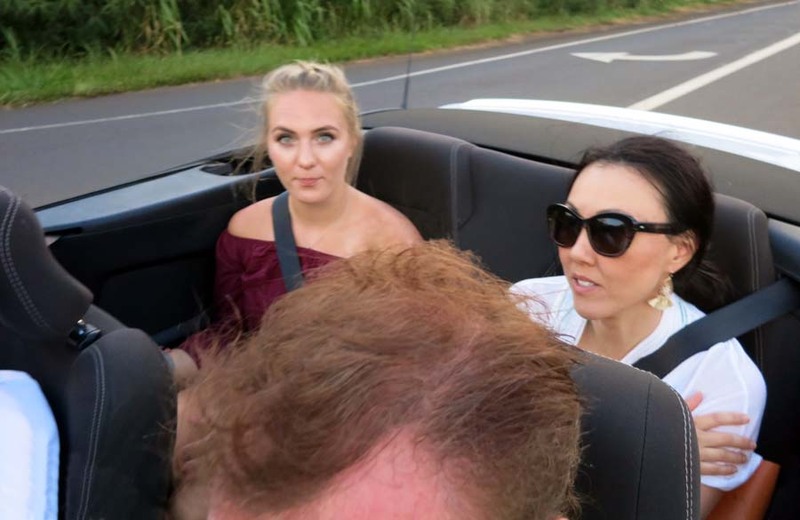 We drive to dinner in a couple of cars. We take our convertible. 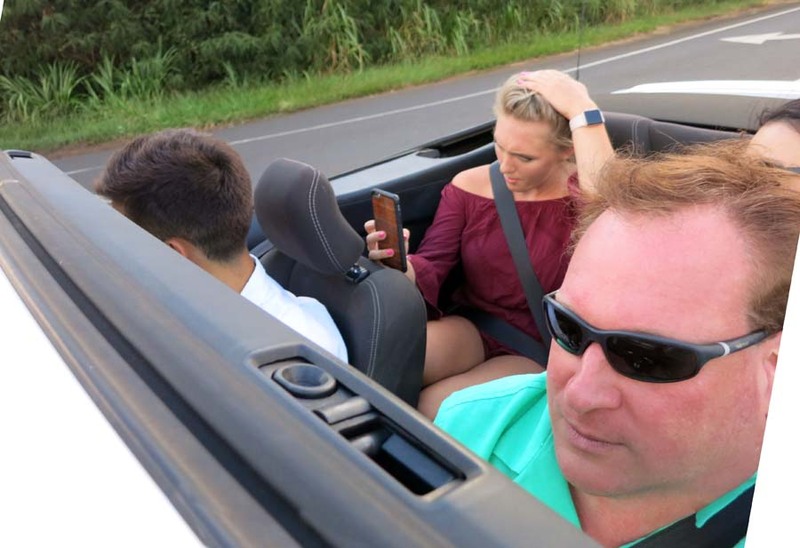 A selfie in our convertible. 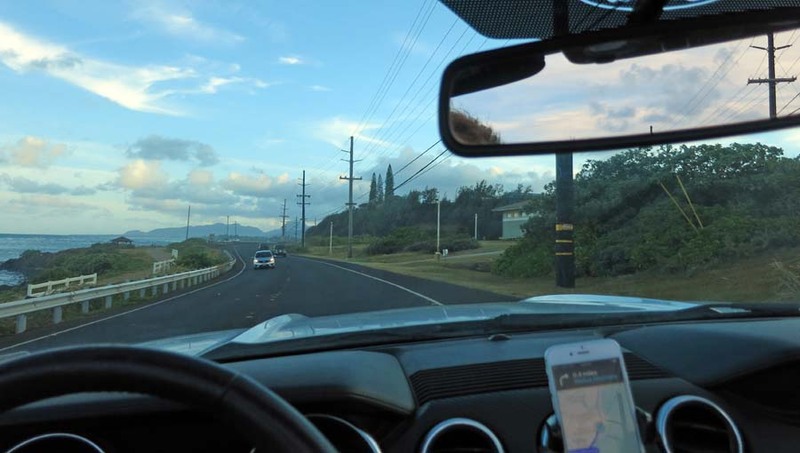 I'm driving (and taking the picture). Charlie is riding shotgun, and Kendall is on her phone in the back seat, and Katherine is hidden away behind my head. Kendall must have noticed I was taking a selfie. :-) Katherine looking very stylish. 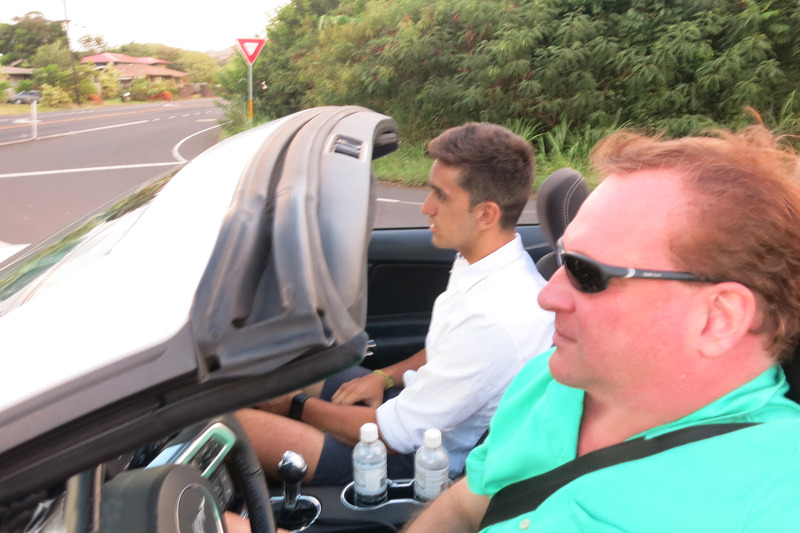 A good picture of Charlie (white shirt) and myself (Brian, in sunglasses) driving. We have dinner with our friends at the "Lava Lava Beach Club" (here is a Trip Advisor Link) which is a super festive, fun venue. Below Charlie and Kendall pose for a picture. 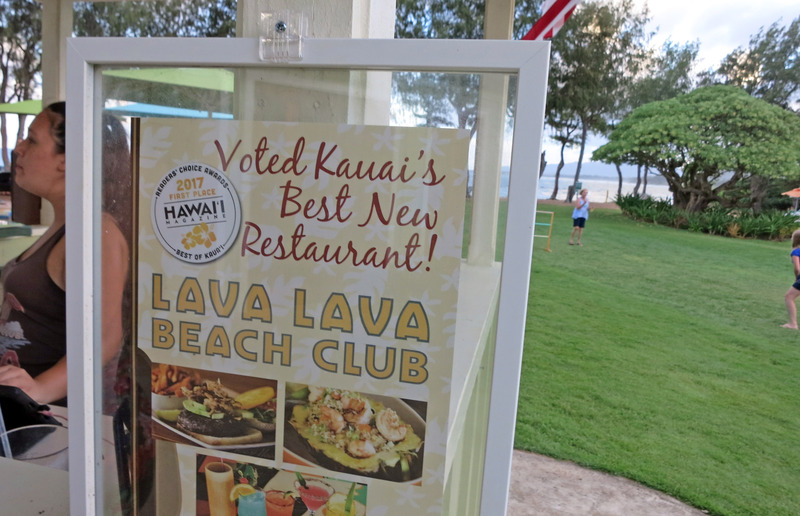 Some signs of the Lava Lava Beach Club. 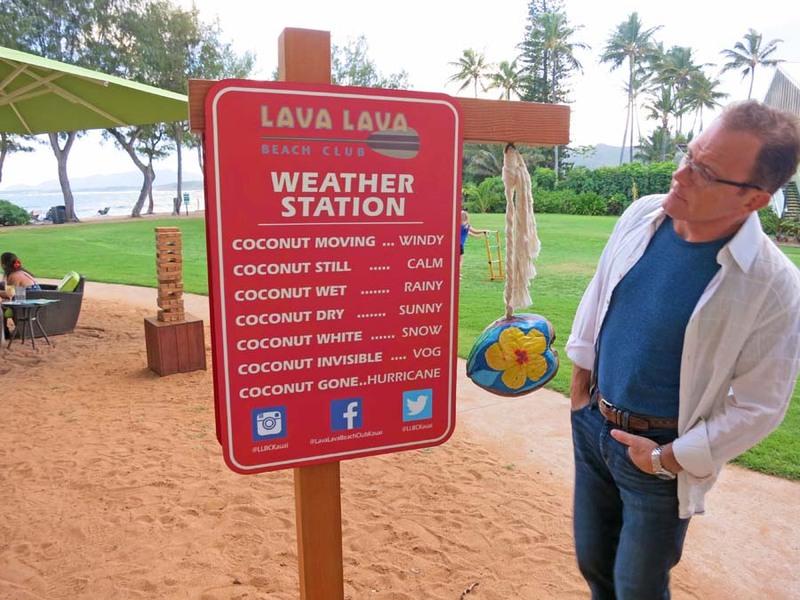 The Lava Lava Beach Club has a sophisticated weather station to figure out exactly what the weather is like. It is extremely accurate and based on a coconut. People throwing bean bags and there is live music (far right of photo below). 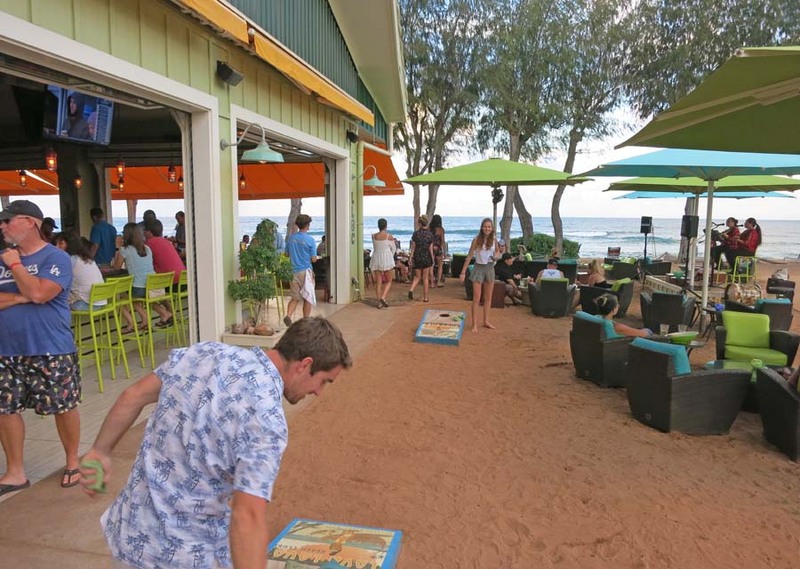 Click here to watch a VERY short movie about the Lava Lava Beach Club in Kauai. 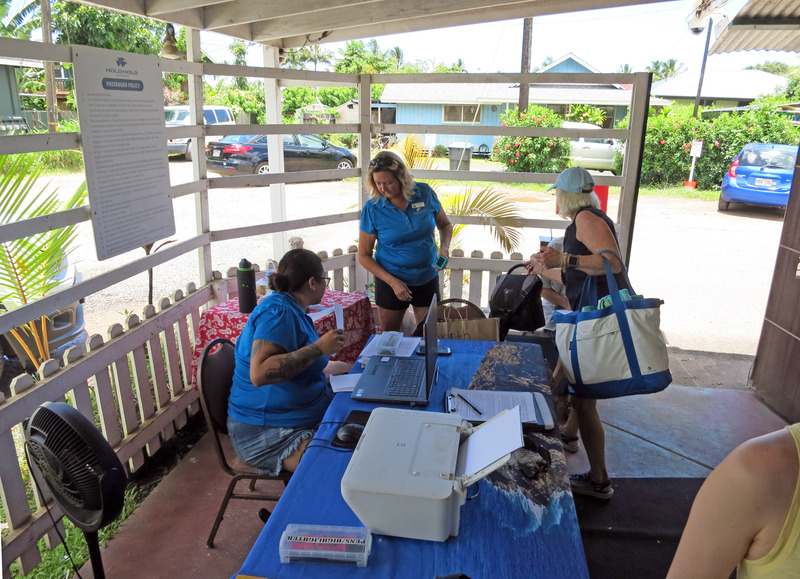 Our first table near the water. 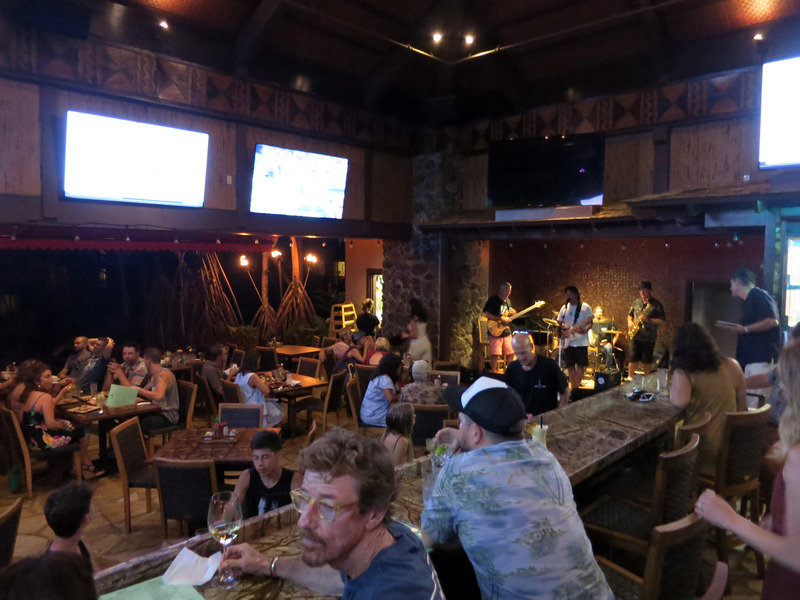 Later we moved and ate dinner further away from the music. 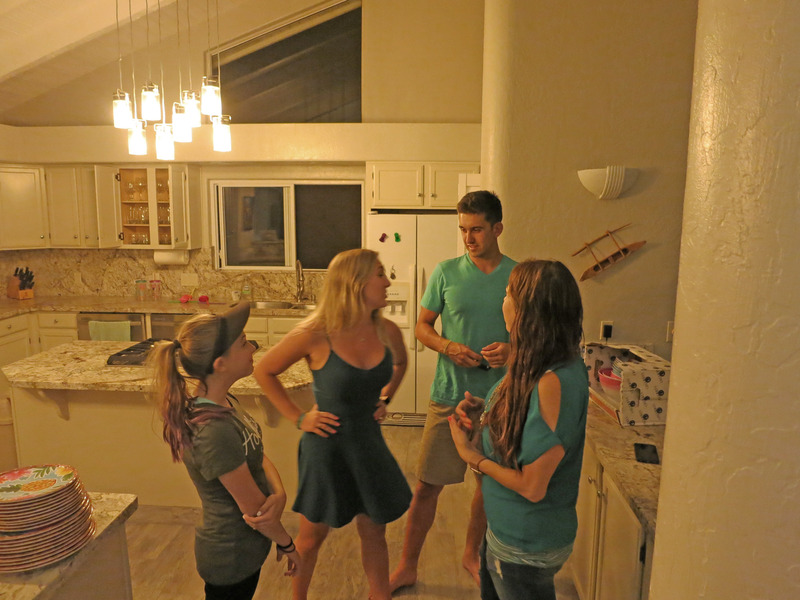 Late a night back at the house, Jennifer makes cookies getting help from Charlie and Kendall. Our final breakfast at the St Regis the final morning. We are travelling home this day. 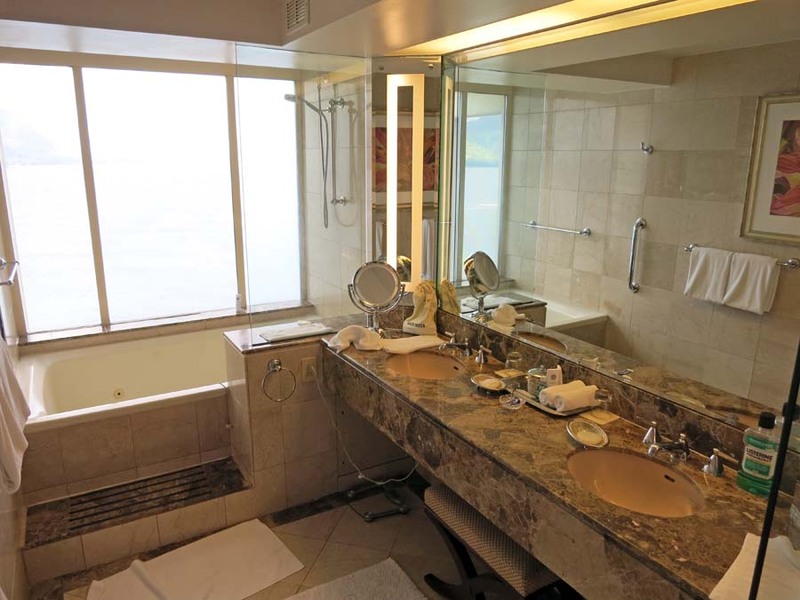 The showers in these fancy rooms at the St Regis are REALLY interesting. 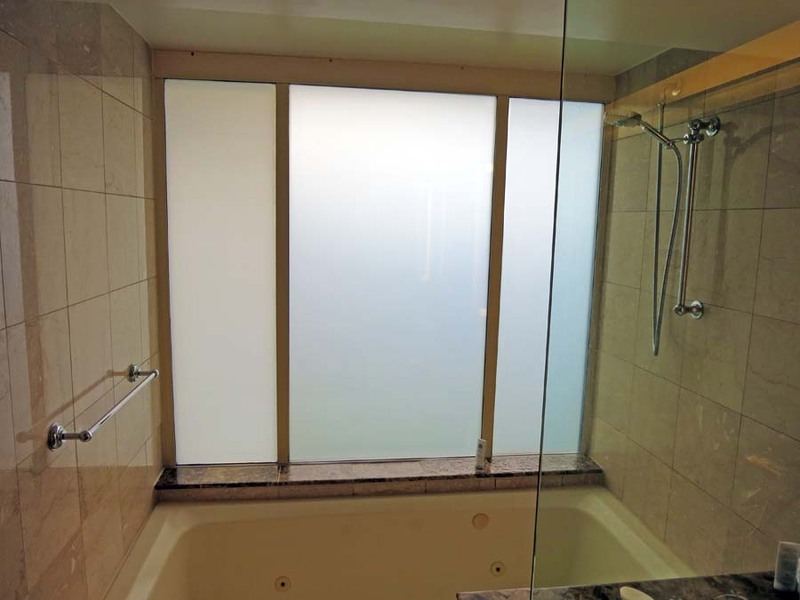 Below is a picture of the bathroom with the "smart glass" in the shower in "opaque" mode. 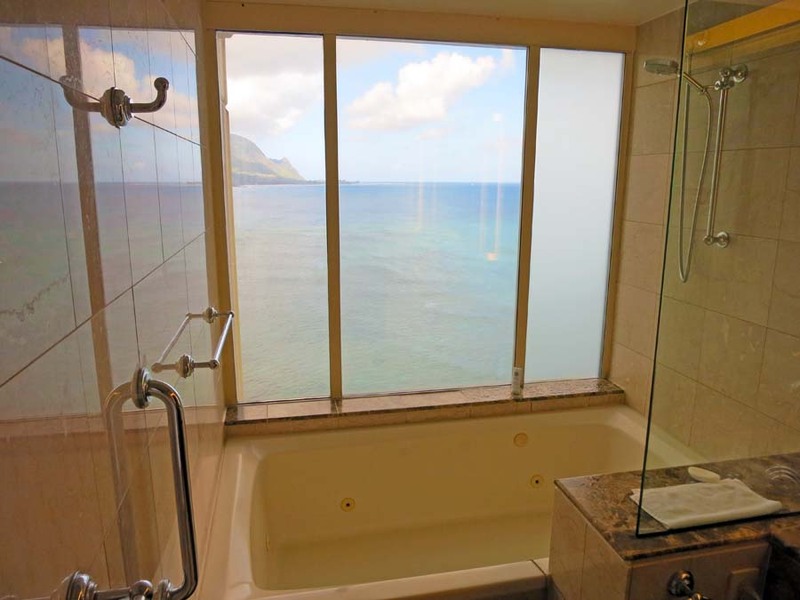 Below is the same shower window with the "clear glass" setting (a flipped light switch) so you can take a shower looking at Hanalei Bay. Again same shower with the light switch flipped so the privacy glass kicks in. 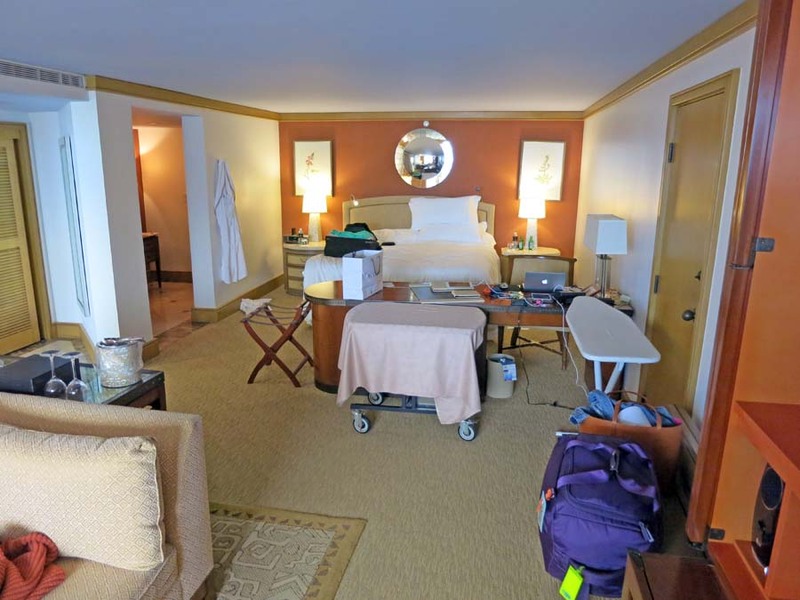 A picture of our main room as we depart. Click here for a movie of Katherine getting a TSA pat down. 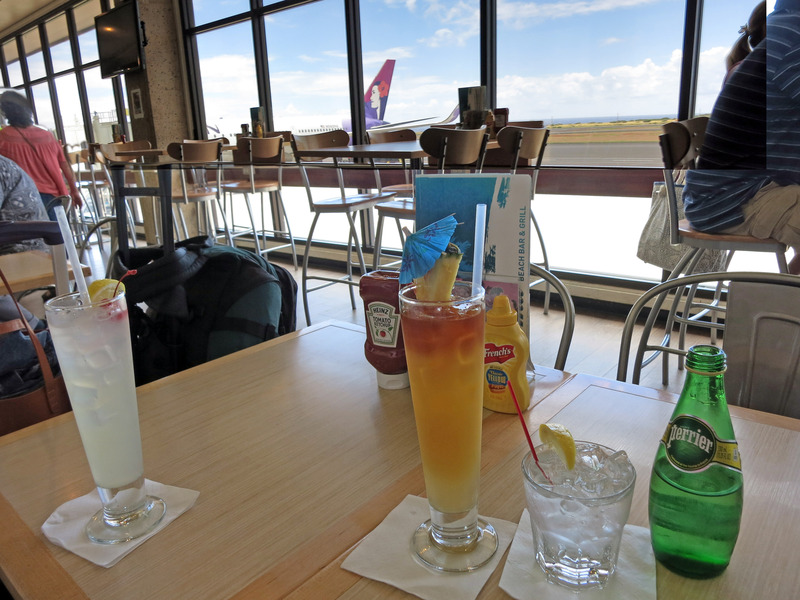 In the airport, a final Mai Tai before leaving Kauai. The picture below is very "meta". 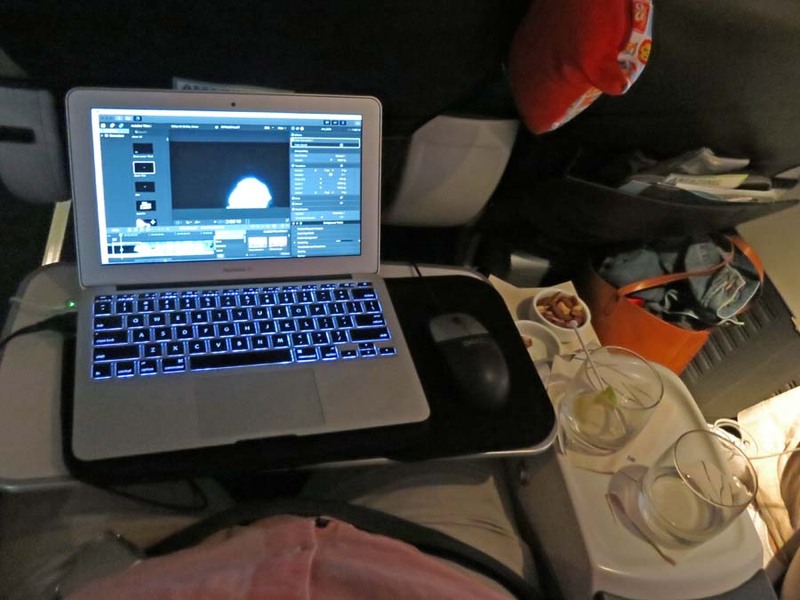 I'm editing THIS VIDEO on my laptop during the five hour flight home. We are in first class on Alaska Airlines. 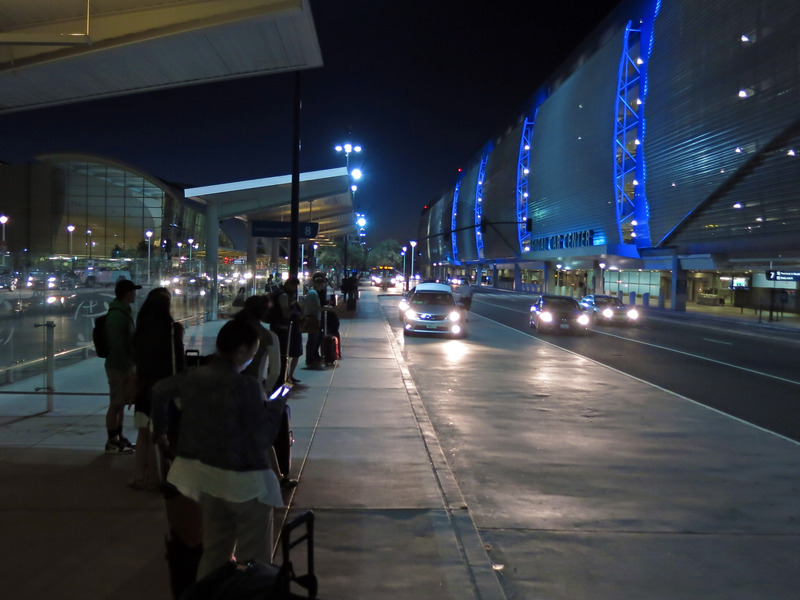 We arrive in San Jose at about 9:30pm. 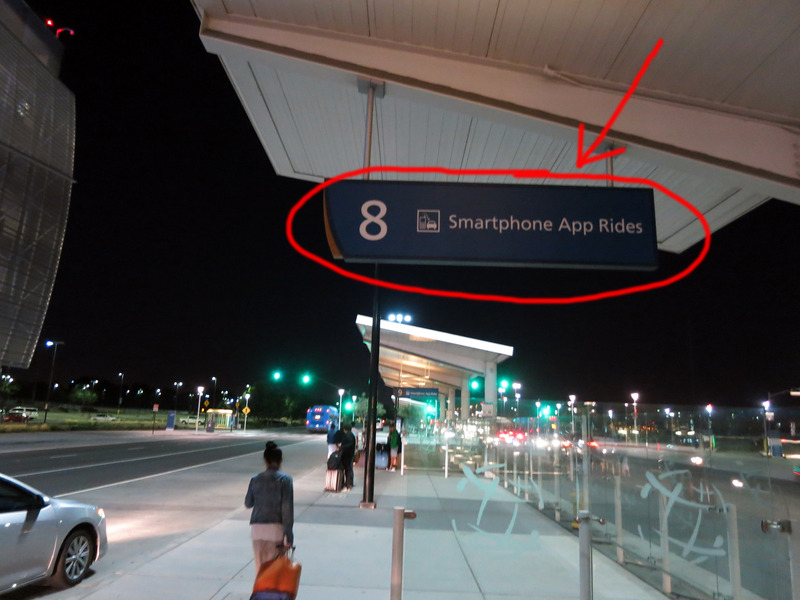 There is an area to meet your Uber or Lyft called "Smartphone App Rides". San Jose Airport at night waiting for our ten minute ride home. That's it! All done! Stop reading now! 7 days in advance - if necessary mail big heavy bag ahead so you don't have to check baggage. 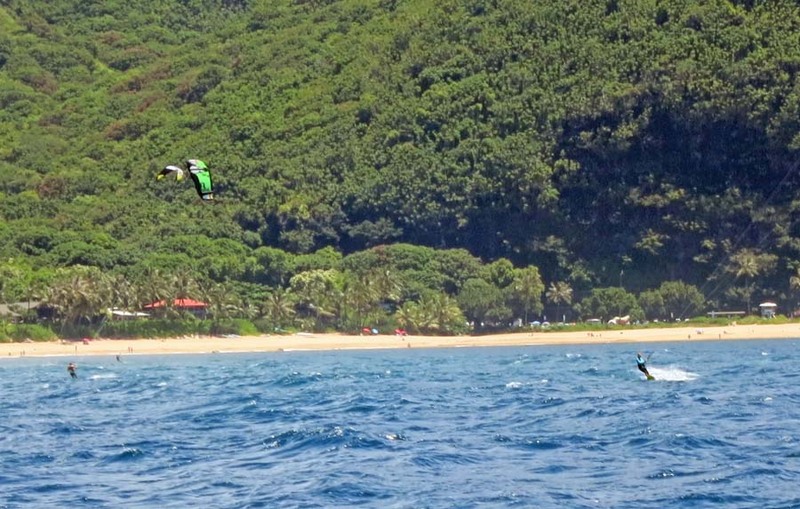 Camera - consider GoPro, Canon 110, SuperZoom (to film kite surfing), waterproof underwater camera, other? Longer "parachute cord" to tie up Wave Runners, etc. They never seem to include a long enough rope. book for plane? 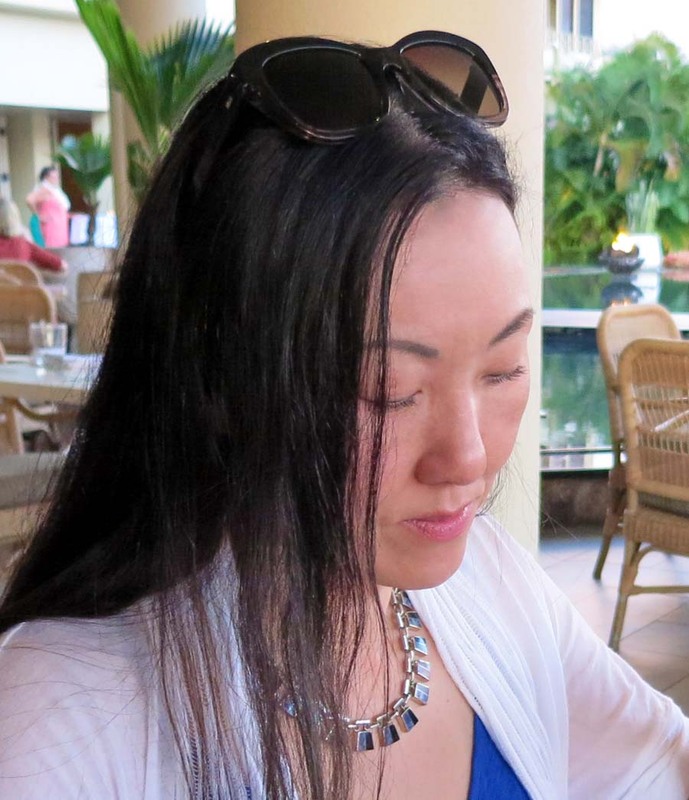 Download into kindle?